We ate the leftovers from last weekend’s party. 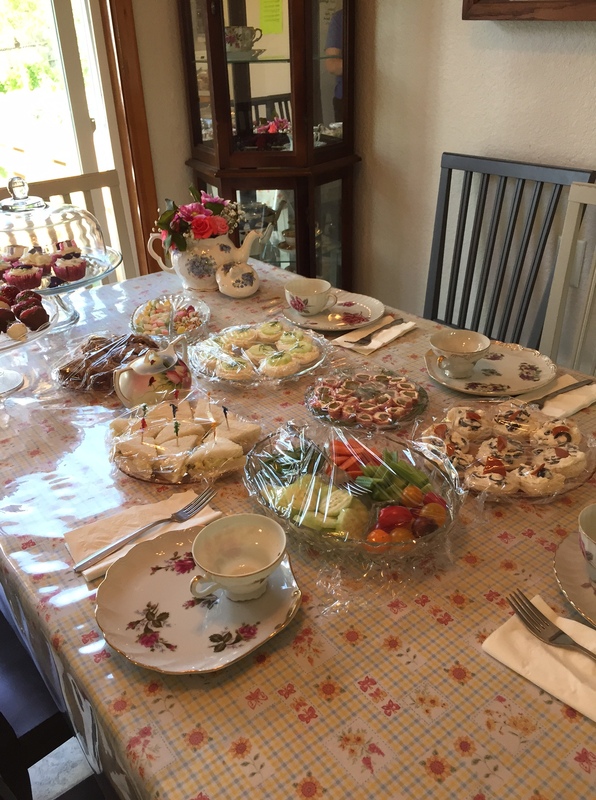 For the beginning of the week, we feasted on deviled eggs, veggies, sweet and sour turkey meatballs, pickle rolls, chips, tortilla rolls, dipped strawberries, rice, and sandwiches. There is still a little cheese left, but most of the rest has been devoured. My oldest daughter had some baked potatoes left over from a party she had given. She asked if I wanted them, and of course, I said I did. I was surprised when she came in with a plastic grocery-store bag full of the largest potatoes imaginable! They were all baked, and there were just too many for them to use up. It was quite a challenge for us, as well!! I had baked potato bar one night with broccoli from the freezer, cheese sauce, and cottage cheese. I tried the Tillamook cheese sauce mix in a package that I purchased last week. It was $1.99 and I had a digital coupon for $1.50 off. It was delicious. There were 2-3 occasions when people ate a portion of a baked potato at a meal. I fried one for breakfast one morning, and put in a few slices of kielbasa sausage. 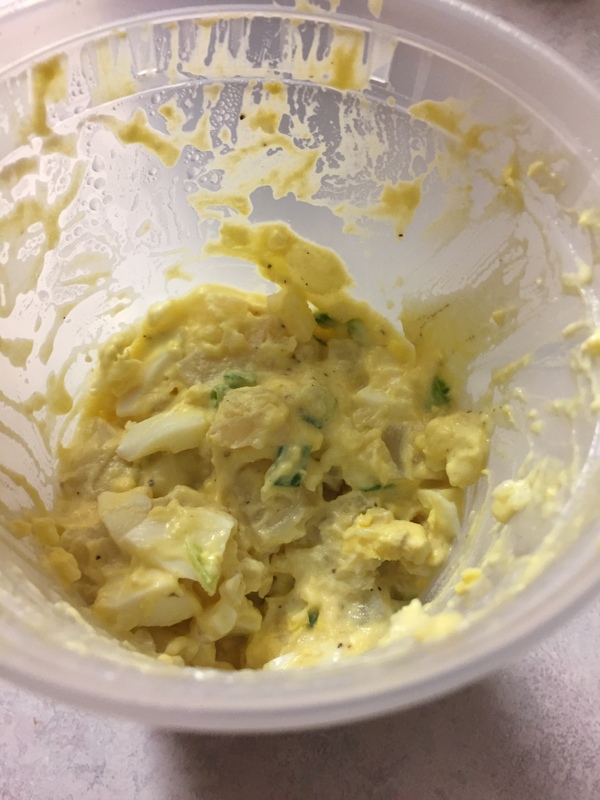 With the last 2 potatoes, I made potato salad. I included some hard-boiled eggs. As you can see, it was almost devoured before I could even snap a picture! Michaela ate many, many peanut butter sandwiches with no jam, honey-nut Cheerios, and about 1/2 gallon of milk in 2 days, if not more. She likes milk. And, there’s a new rule that she cannot have soda until after she drinks a full bottle of water. So, she drank water, and in fact, drink more than the forced amount a couple of times. That’s great. We are still on water restrictions, and so I bought a bunch of bottles of water. They say the water is safe for anyone my size, but I don’t want to take chances with my health, Rob’s health or the children’ health. So, I don’t panic if I use some in cooking or drink a little, but try to use other water for the most part. Jake ate Cup-o-noodles, chicken flavor, aka instant lunch. In fact, I just bought a new case of it last night, because he used them all up from my pantry. We don’t go through many of those, except when he is here. Frankly, we don’t care for them as much as he does, but I’m happy to get them for him if he wants them. 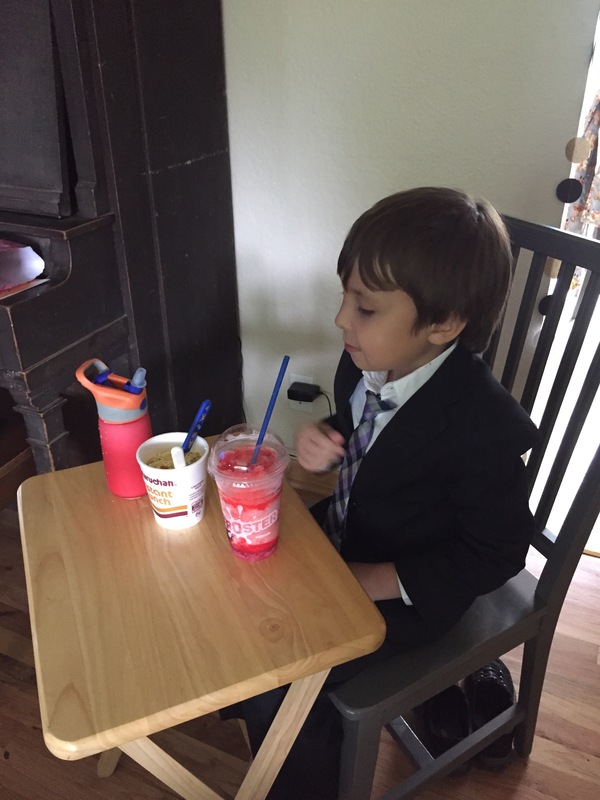 He drank a lot of apple juice, and ate as many frozen Otter Pops as he could con out of me or anyone else. He also drank some water–very rare for him–declaring that he was not under 6 years of age and didn’t have any health problems. He was being a silly little stinker at the time, smacking his lips and declaring how good the water was because one of the other kids had just told him to not drink it:), but at least he got some water down for once! 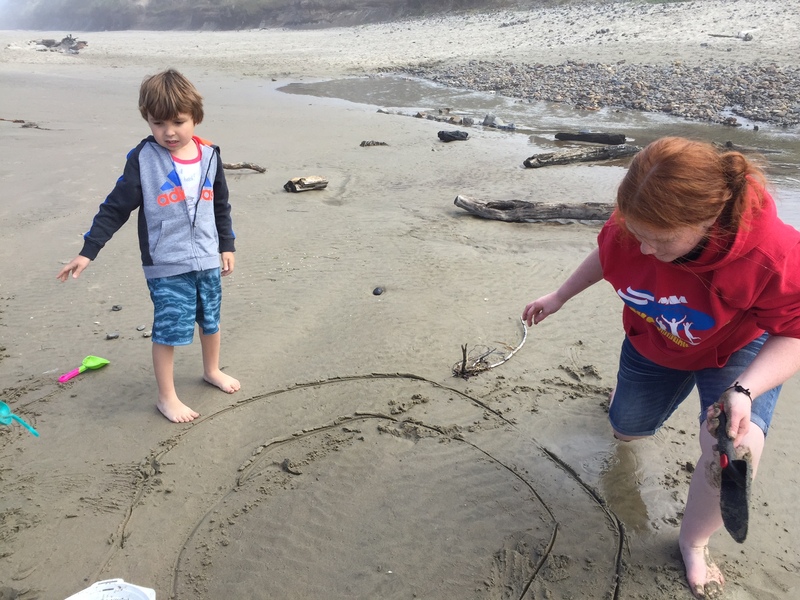 Birthday week continues–2 down, 2 to go! Today Ja’Ana wants pizza for her birthday dinner, so Rob will grab an inexpensive wheat-crusted one somewhere, and I will eat one of the gluten-free ones I made and froze last week. Tomorrow, Rob is barbecuing for our little friend, Danait’s party, and so I’m making a large potato salad again today. I will put green onions in it, again. Good thing they are growing so well in the garden right now! I will also pick lettuce today for salads and to take for the hamburgers tomorrow. I grabbed a few grocery items last night, such as the Instant Lunches, and a bag of potatoes. All this potato salad means I’m really going through potatoes right now. It’s great that they are very reasonable! I only had to pay $1.99 for 10 lbs. That’s a lot of good food for the price. I will look through my fridge today, but don’t anticipate buying very many other groceries for a few days, at least. Having lettuce in the garden really helps, and I was able to get a bag of 7 small avocados for $2.49 last night. We love them in salads and guacamole. Patsy and I just ran into Grocery Outlet on our way home from her first high school youth group barbecue (yikes–she’s getting so old! ), and I was pleased with what I found. You just never know what they are going to have. 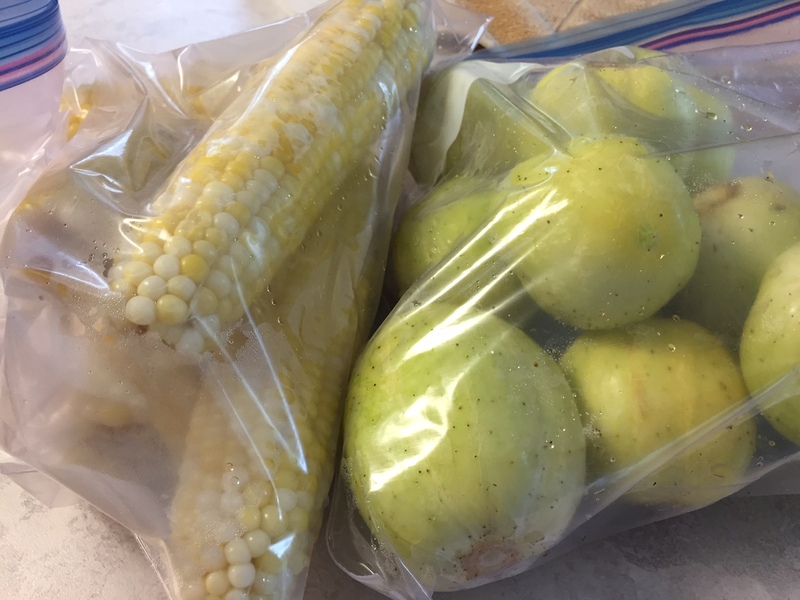 Today, I need to get hot dog and hamburger buns for the party tomorrow, and a few tomatoes to slice, but have the rest of what I’m bringing. My sister has been up with Harnet, gathering supplies for this party at least twice, and we have it well organized between the 3 of us. It’s going to be very fun. 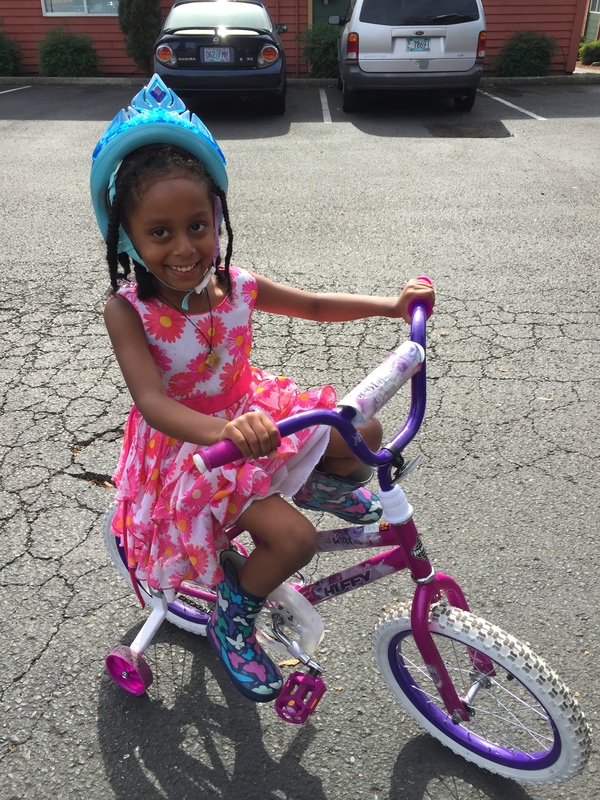 There’s nothing like cute little kids enjoying themselves to brighten a day! 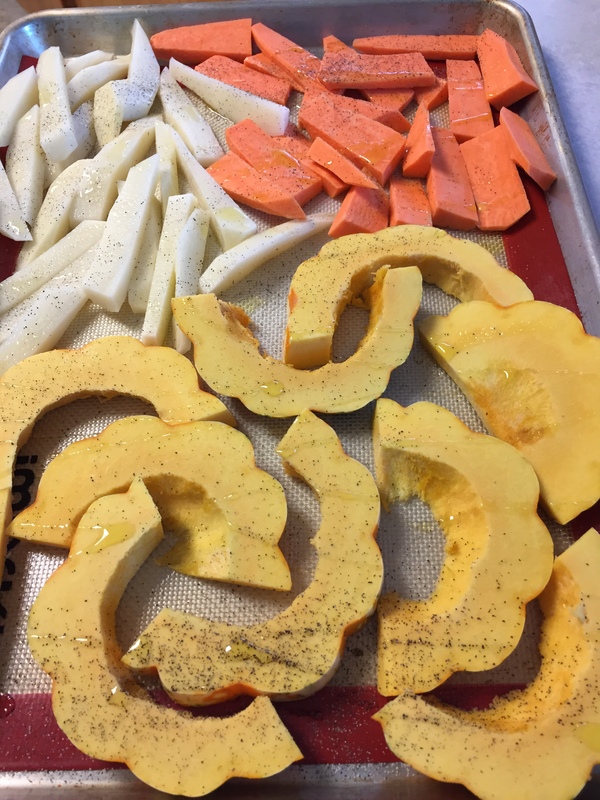 What Did We Eat–Winter Garden Goodies! January 20, 2018. This week, after looking around outside in the covered porch, I found a few items lurking around out there. I also took a walk out into the muddy, muddy garden and found a few things. I decided to use those up instead of buying more. Novel thought:). LOL! Last weekend, I went out and got a few things, mostly produce. One thing I bought was a 15 pound bag of potatoes for $2.50. So, we baked up a bunch of those. We’ve had those a couple of times this week. 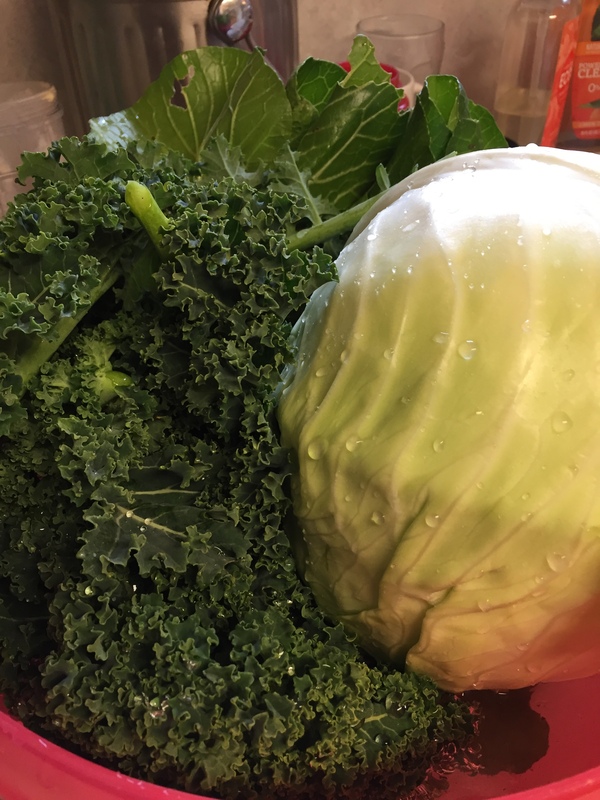 Out in the garden, I found a nice cabbage, some kale and a bunch of boc choi. The boc choi was a surprise, as it was hiding behind some other things and I didn’t see it until I got out there! 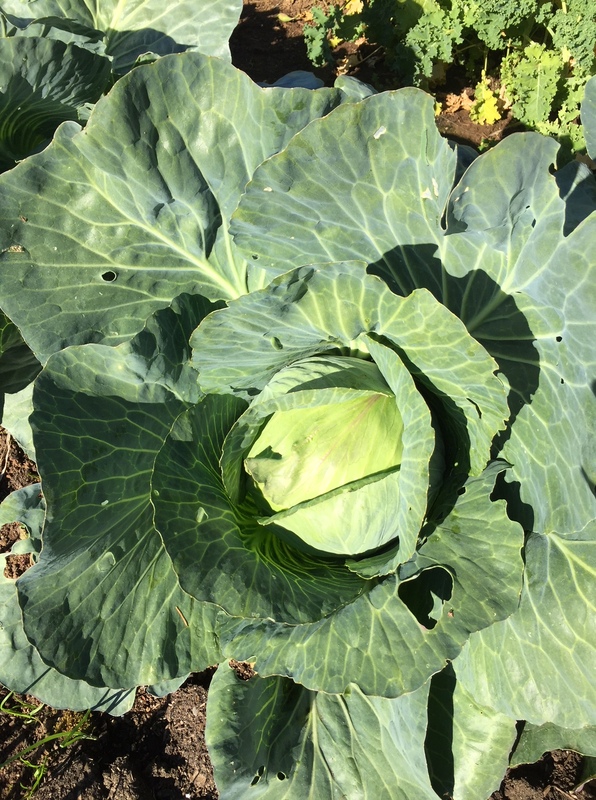 I finished up a head of cabbage I had previously picked, and was delighted to see that this one was in excellent condition. On the covered porch, I found a small handful of potatoes, a couple of small squash and a few onions. I should tidy the porch more often:). That cabbage grew a lot since this picture was taken at the end of last summer! I also cleaned out the small freezer above the fridge because I had the things all slide out and land on my feet one too many times. I found a couple of mystery baggies of various meats and some other items. So, I made a soup from pork(? ), the potatoes, an onion, a bunch of cabbage, carrots, frozen beans, and some tomatoes. I also dumped in some pinto beans that were also lurking in that freezer. I cut up a bunch of cabbage and put it in a Ziplock in the fridge for coleslaw over the next couple of days. I made smoothies from fruit I froze last summer. Rob BBQ-D some steak from our new beef we recently received to see how it was. It was amazing! 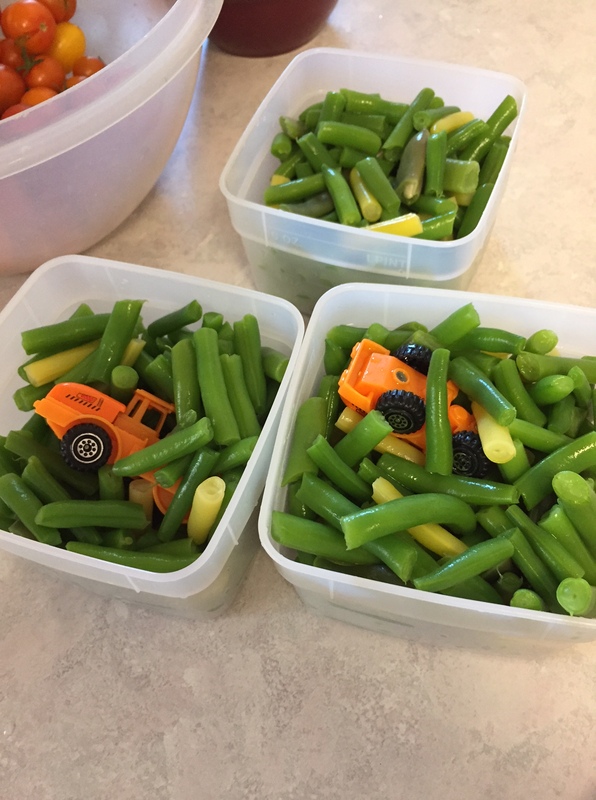 We had baked potatoes and canned green beans with it. I also used up every avocado I had, which Rob got at Grocery Outlet for a very low price last week. 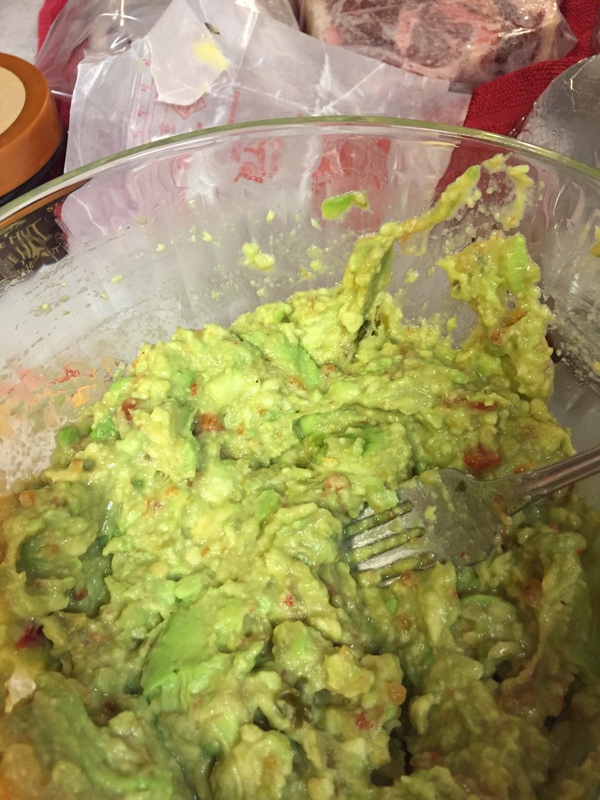 I made guacamole. We had enough for 2 days of that, too. The peaches and applesauce have really come in handy this week, since Lovana had 2 wisdom teeth taken out on Monday. She had a really hard time with one of them. So, she’s been eating lots and lots of ice cream, peaches, applesauce and mashed potatoes. When I took her back to the dentist on Thursday, I got her a milkshake at Burgerville. She is finally feeling quite a bit better today, and went to work for the first time since last weekend. Good thing. The ice cream is about gone:). The triple chocolate, the chocolate chip mint, and the vanilla. Trust me, she had a lot of willing helpers to eat ice cream. So, you could say ice cream was one of our food groups this week. I decided to skip my usual weekend shopping this week. Instead, I want to use what’s in the fridge, home-canned and frozen items, cabbage, boc choi, kale and pantry items. If it’s going to fall out of the freezer onto my feet, that’s it. It’s going on the plate! Later in the week, if I need milk or something, I’ll worry about it then. I’m right on track for a moderate-spend month, and I’ll just leave this week’s money in it’s envelope in case I run out of things later this week. I have been wanting to make a menu plan for a few weeks, but haven’t had time. 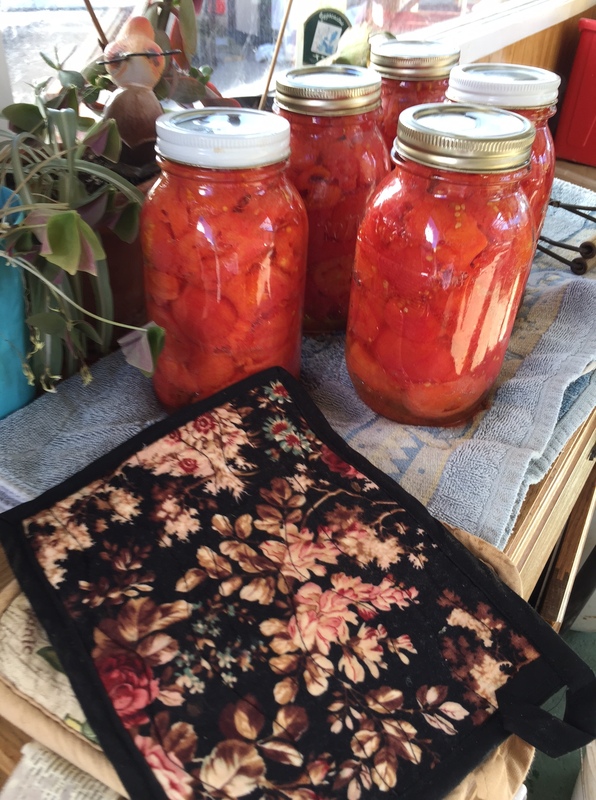 I’ve been too busy gathering, canning, and preserving for winter. I will assure you, we have been eating never-the-less! Now, it’s time to plan meals that use my preserved food. I am not one to can/freeze food and then want to hoard it. I figure I’ve gone to all that work, now I want to use it up! I usually plan one meal for each evening, and plan the leftovers for lunches and perhaps one night later in the week. This week, I’m trying something a little different. I asked him how it worked, and he said it helped him a lot. When he gets home from his job, he is tired, but has been trying to do at least 1 extra job around the house or shop each evening. I’m all for that!! So, if dinner is cooked or in the Crock pot, it makes that do-able for him. 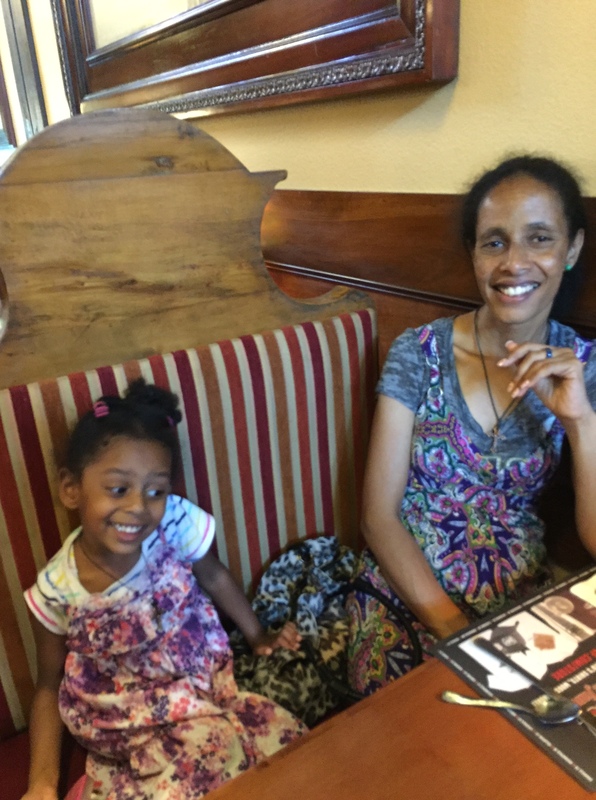 Because I have appointments for the girls both Wednesday afternoon and Friday afternoon, I will make sure the meals are pre-cooked those days, as well, or in the Crock Pot. Sunday: We had ham and scalloped potatoes for our family Sunday dinner. My sister hosted this week, and I made a small broccoli salad, marinated cucumber salad, and lettuce salad. I used garden produce in all 3 salads, with only a few purchased items. The garden is coming to an end, but there are still items out there, and I want to use them. I cooked a roast in the crock pot while I was gone today. He can serve it as meat on a plate, or take it in his lunch, or make a sandwich. 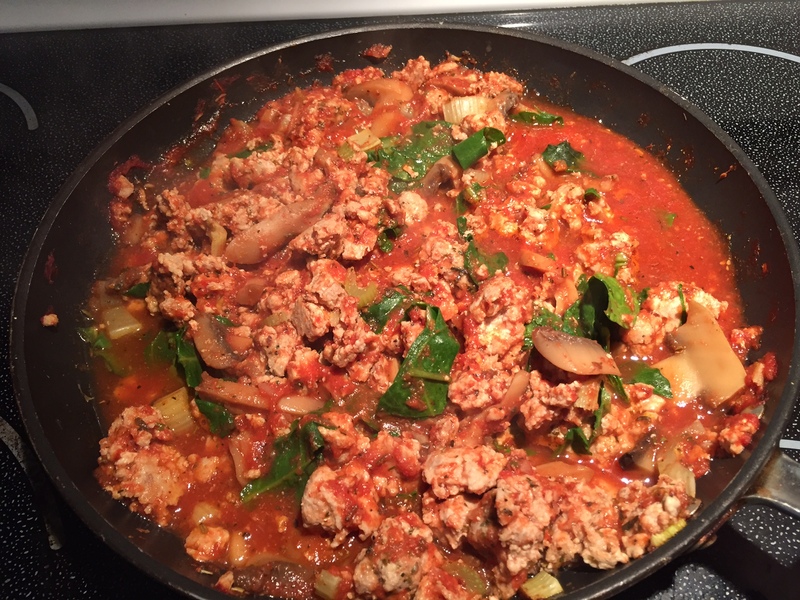 Spaghetti sauce: I will make this and use it for lasagna one day, and spaghetti another. I have a quart of tomatoes that did not seal and needs using up. I also have zucchini from the garden, and I may make part of the noodles in the lasagna out of them. I usually put a little chard in the sauce, too. I am cooking up some taco meat right now. If people are hungry after evening youth group, they can have tacos, if not, it will be a choice in the fridge. I want to do a beef stew with carrots, since I have 4 gallon Ziplocks left from what we dug up. I also have some garden potatoes and onions. I want to do either potato soup or clam chowder. I have a loaf of rosemary potato bread I got from the day-old section when I visited Bob’s Red Mill. We had some for lunch today, but will add the rest to meals during the week. The non gluten-free ones in the family love having a treat that has wheat in it occasionally. Since I don’t even keep a speck of all-purpose flour in the house, I don’t mind buying them things when I can. I always have whole wheat bread for their sandwiches, but I don’t make it anymore. I plan to make gluten-free foccocia bread. I have a recipe that has zucchini and parmesan on top. It’s good. I will also make cornbread, as Rob is hungry for that. If there is time, a batch of muffins would be great for breakfasts. Of course, I can make any other baked item that comes to mind, if I have time. In the garden, we still have purple beans, lettuce for salads, cucumbers marinading in the fridge, snow peas and raspberries. The cherry and pear tomatoes are still producing well, but the larger tomatoes are not very prolific any more. Still, I may get a few. The basil and cilantro are great from the last planting I did. There is chard and kale, and a few zucchini and peppers. I have 1 head of lettuce from the store to mix with my limited supply of leaf lettuce, and can start buying a few veggies, if needed. I think there will be plenty for this week in the garden, though. 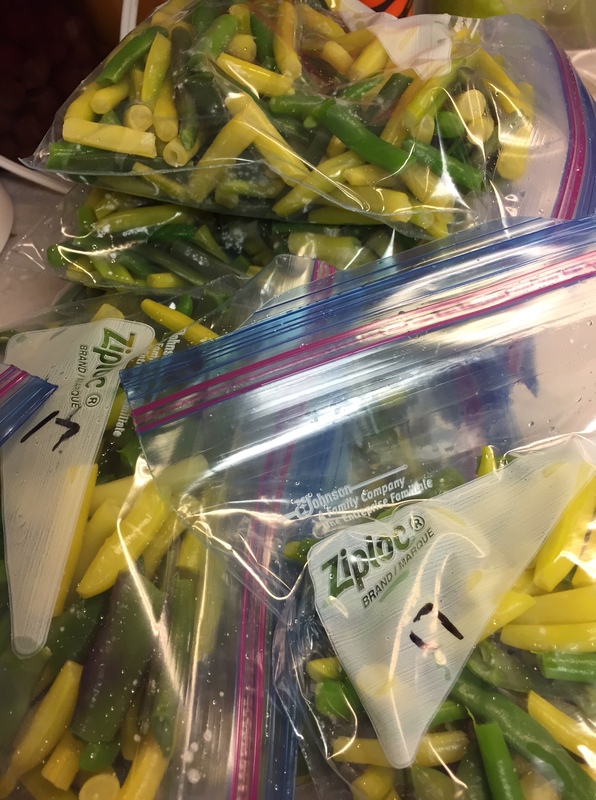 We should use some of the preserved green beans if we run low on fresh produce. There are an AWFUL lot of them out there in the shop:) It’s so fun to look back on our summer’s labor, and just settle down to start eating it up! Now, I will get busy cooking. I will do a couple of things tonight, and likely the rest tomorrow. I will continue searching this week for a great deal on Rob’s coffee pods, and butter for a price I like:) Otherwise, I think we are set for a while. 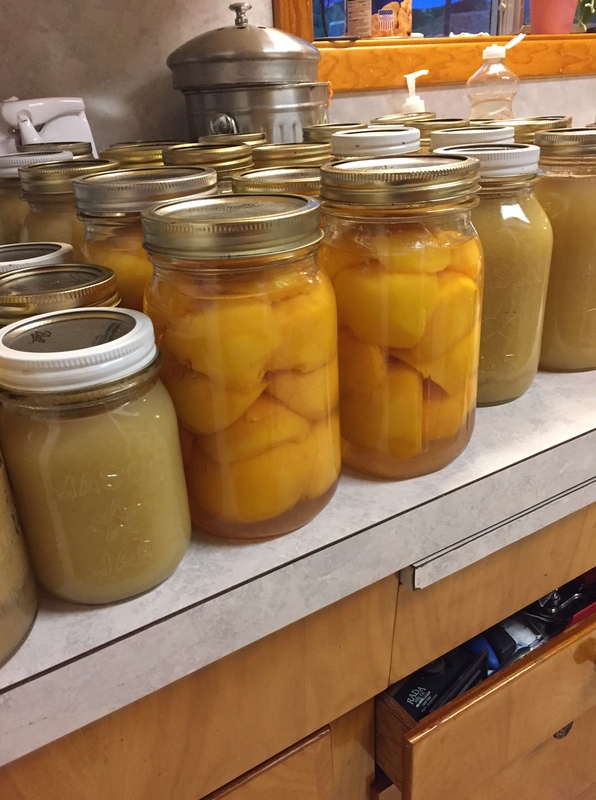 The last peaches are in the jars, boiling as I write. I only wanted to can 21 quarts, as I still have some left over from 2 years ago. With what’s in the canner, I have 35. That’s what happens when you are picking peaches and there are a lot of nice ones, and you and you sister keep picking……That should be more than enough with what I have left. We have done 28 quarts and 9 pints of applesauce so far, and I still have another batch of apples to go. Then, I picked a box of tomatoes from the garden tonight. So, the canning is not done, but I’m gaining on it. The menu plans revolved around the garden produce. Our garden is pumping out the veggies so quickly that we cannot keep up. My sister’s garden is, too, and she shared the corn with us. Rob cooked a turkey on the BBQ at the end of last week. We had that on Sunday for our family dinner with veggies. I froze about 7 quarts of broth after I boiled the bones. We just had sandwiches and leftovers for Sunday night, and there was a peach and ice cream social after church Sunday night, which we enjoyed. Breakfasts are always eggs, toast, cereal, fruit, etc. in any combination, or we just eat leftovers. Monday: We ate leftover turkey and other things for breakfast and lunch, and I went and visited my friend, Harnet, and we ate together up there. J went with me, and the rest of the family was on their own at home. J was a huge blessing, as she spent a lot of energy keeping Danait occupied while us mamas did errands and talked. 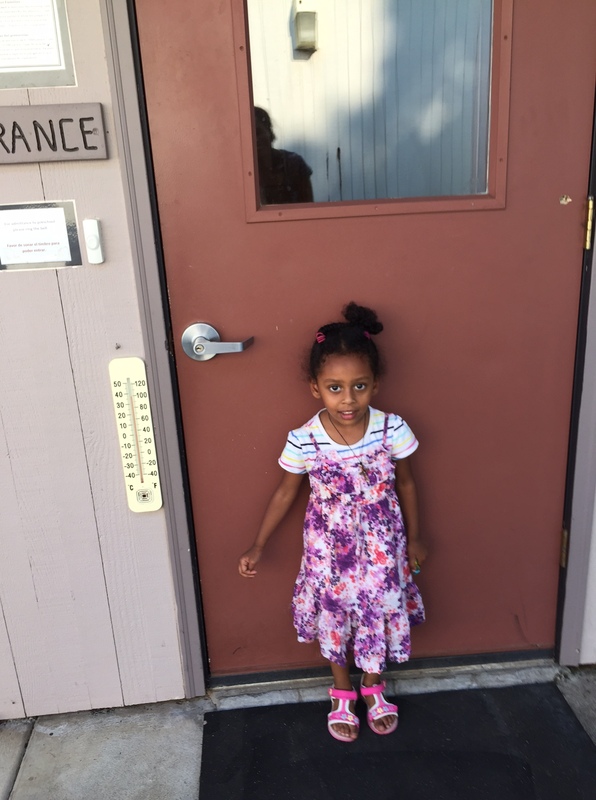 We drove around, doing various errands, and found the preschool where little Danait starts preschool soon. 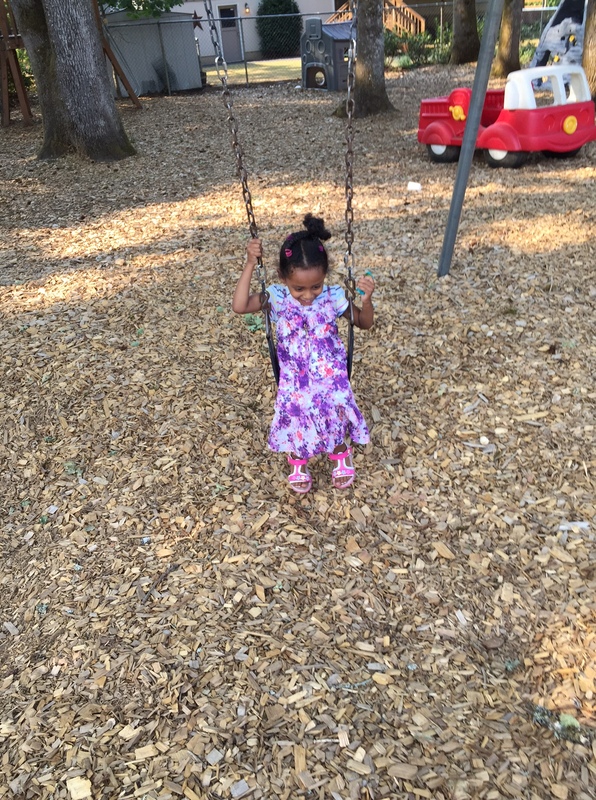 She was so happy to see the awesome playground! Then, we ate at an Italian restaurant. We all had fun there. Tuesday: Lunch: I had salad, others had sandwiches or leftovers. Dinner: I dealt with the rest of the turkey today. There was quite a bit left, as it was a huge turkey. I filled several baggies with pieces of turkey, and froze them for quick casseroles, soups and sandwich filling. I made crock pot turkey taco soup with some of the broth and some turkey pieces. I also used some cooked, frozen black beans that Rob discovered in the freezer and some home-canned salsa. The turkey broth has a smoky flavor since Rob did the turkey on the BBQ, and that went well with the southwestern flavor of this soup. I made gluten-free cornbread to go with it. There was a lot of soup, so I sent some home with my sister when she picked up Jake, and there is still some left!! Wednesday: Lunch: Leftover soup, turkey sandwiches, and toast/ciabatta bread for Jake. 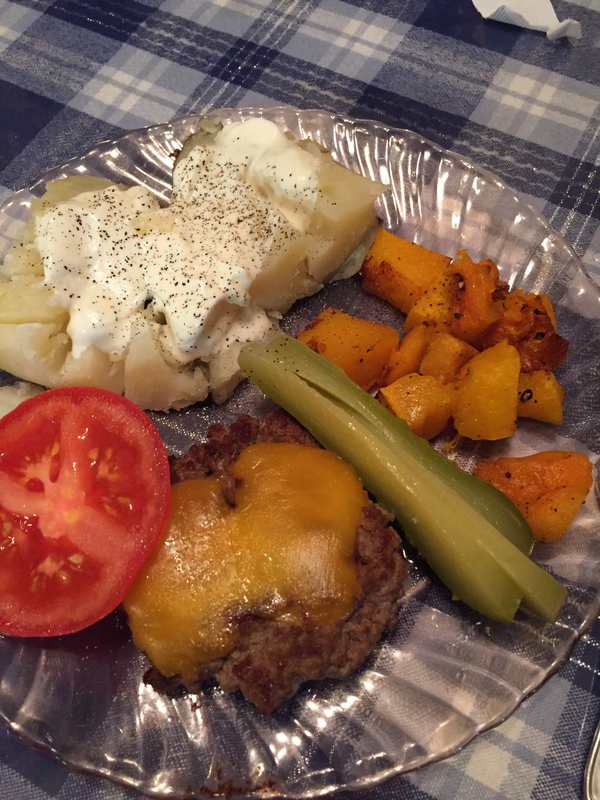 Dinner: Hamburgers. I have some buns that need using in the freezer, lots of tomatoes, etc. I may make potato salad, if I get time. Thursday: Lunch: Sandwiches and/or leftovers. Dinner: We are going to a party for dinner. I am to take rice and salad. Friday: Here’s the best part! I am getting away for the weekend with Rob for our 35th anniversary. I’m very excited. Our times away alone have been few and far between, so it’s a big deal for us. When you have been raising kids for over 33 years, it’s not easy to get away. The kids are going to stay with their aunt and uncle, and will eat there. I will grab some food items from here to take, and wing it! I will certainly take some garden produce. We can eat out, cook in our room, buy some groceries if needed, etc. Rob is going to go crabbing, so maybe we will have crab. $100 challenge update: As of last week, I had $17 left from the hundred dollars. We spent $10 this week, so there are $7 dollars left. We bought 1/2 and 1/2, celery and bagels. I may need to get a few more bagels, since that is Jake’s preferred food, and maybe some 1/2 and 1/2, since that is Rob’s. Or, I may not use the $7 at all. Either way, it’s worked out nicely. 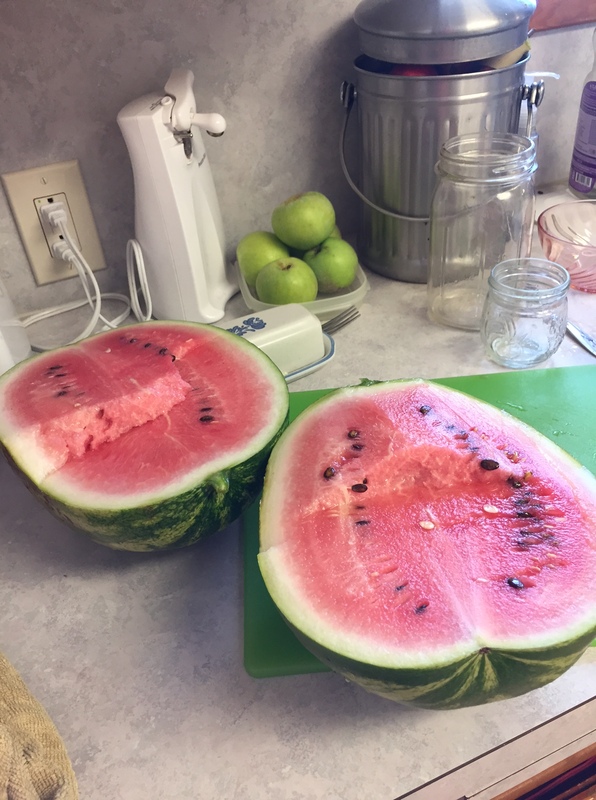 We’ve been feasting from the jars of fruit that did not seal (we had 2 jars of pears, and 1 of applesauce not seal–not bad), fresh fruit before I can it, applesauce, watermelon, cantaloupe, berries, lettuce, cucumbers, beans, tomatoes, snow peas, etc. from the garden. I was given corn, peaches, and a loaf of bread. I’ve pulled quite a few items from the freezer, freeing up space for the peaches and berries I’ve put in. And, turkey. Did I mention turkey? 🙂 It was a BIG one. 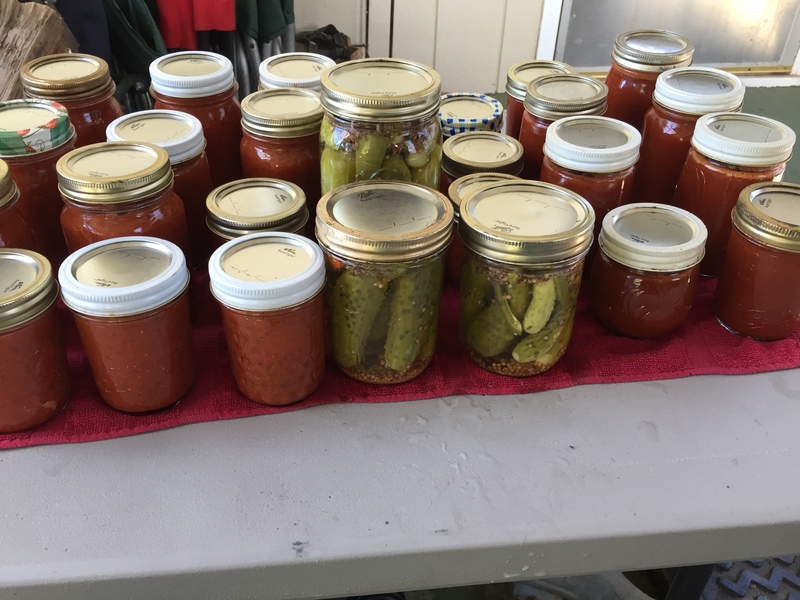 We have used the excess grocery budget money to buy supplies for canning and freezing over the past 3 weeks, but didn’t need to buy anything else this week. We have so much food on hand, and I love how much I’ve been able to put away for winter. I declare the August Grocery Challenge a success! All day, almost every day, food is being canned and frozen around here. It’s very exciting to see the cupboard filling up with rows of colorful jars. The pears are almost all used. 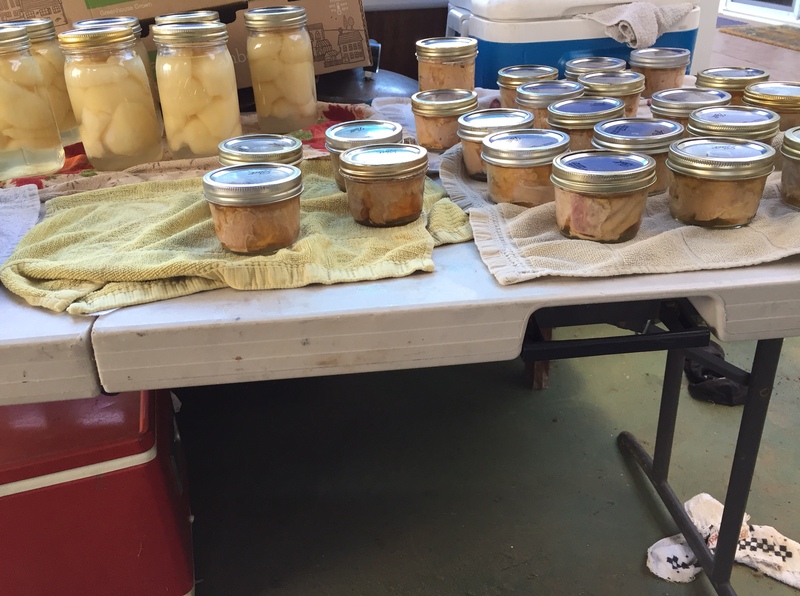 I’ve canned 35 quarts, used many for fruit cocktail and have a batch of pear butter in the crock pot right now. 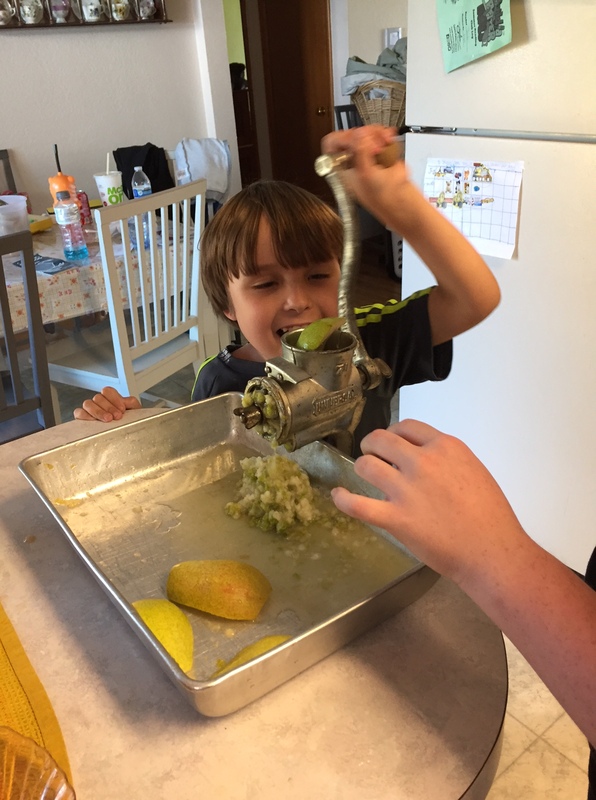 Jake and Patsy loved helping with grinding the pears for pear butter. My recipe is very simple. Grind the pears, add some sugar to taste, and cook down until it is like jam. I was so tired last night, I just filled the crock pot and let it cook all night, but it needs to be much thicker. I will probably use the microwave to cook it down some more today. Rob found a dented gallon of pineapple at Cash and Carry for around $2.50, so I canned it up in small jars to be more usable for pizzas, etc. 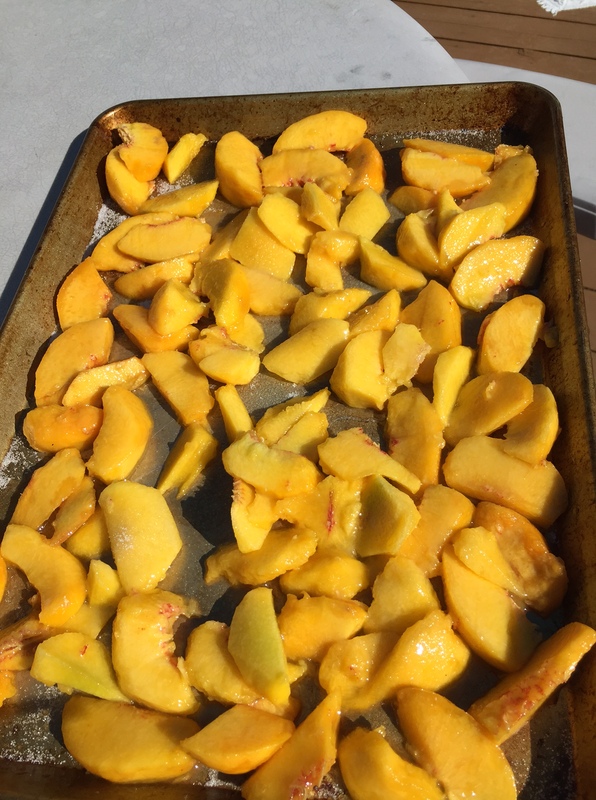 I froze yet another tray of peaches from our tree. They are an odd peach. Do you notice the green color on the edge of some of the pieces? Also, when they look really ripe, they are rotten. So, I’ve been having to work them up when they look a little green to me. They taste ok, though, and Ja’Ana especially loves peach smoothies and peach crisp, so I’m freezing them, tray after tray. After they freeze, I put them into baggies. This way, we can get the frozen pieces out easily to make smoothies. The beans are still prolific. I froze another 7 quarts last night. You can only eat so many in a week!! 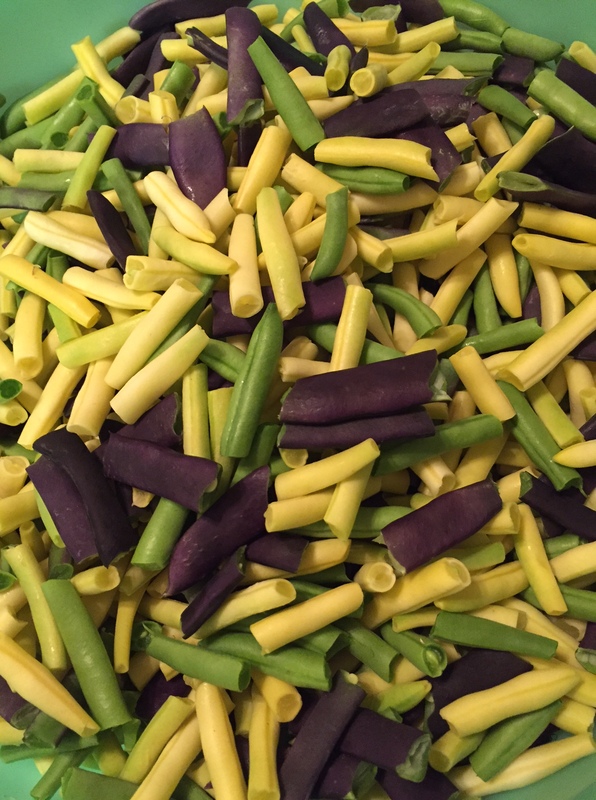 I think I will be serving beans yet again at family Sunday dinner:) I think the green ones are about finished and the yellow ones are winding down. The purple ones are pole beans and will continue until frost, which is great. I will welcome beans in reasonable quantities until frost. I did get a couple of batches of applesauce done, but there are a lot of apples left to process. 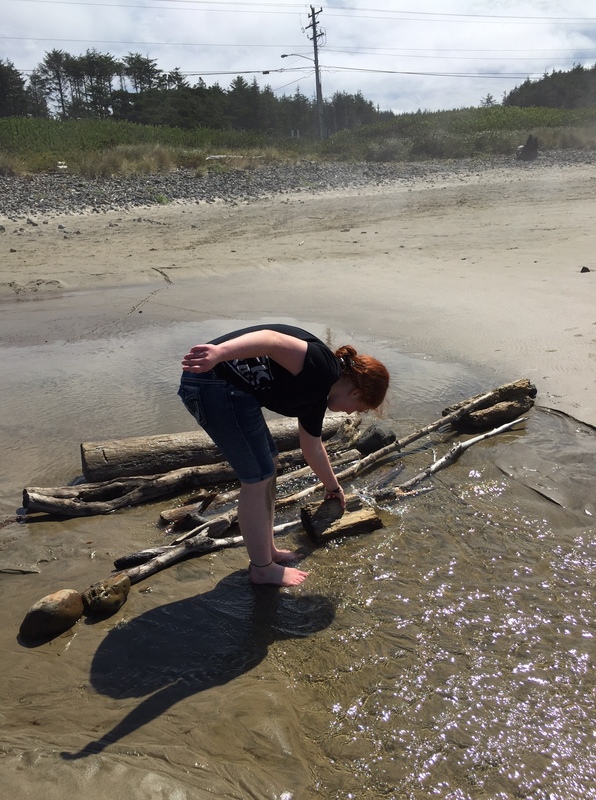 On Wednesday, we took the day off and went down to the beach. 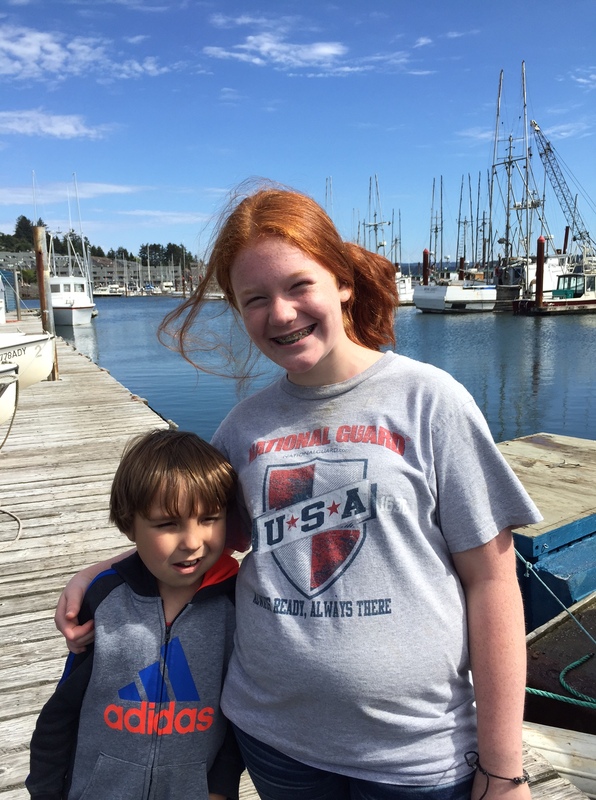 We went to Newport, Oregon. 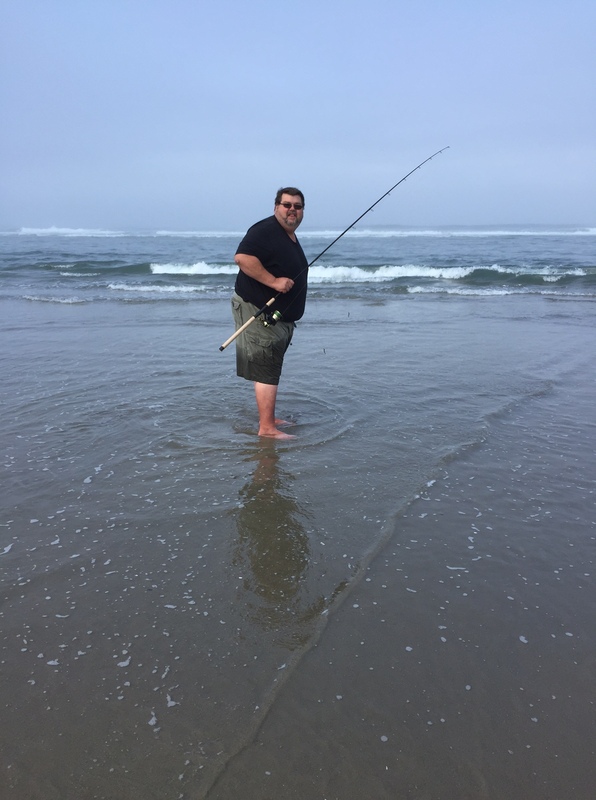 Rob wanted to try surf fishing for perch. He did not catch anything, but we had a great day. It was pretty cold and foggy when we got there, compared to the hot temperatures we’ve had in the valley this summer. It felt great! It didn’t stop these 2 from digging for hours. Or from trying to dam up the little river. 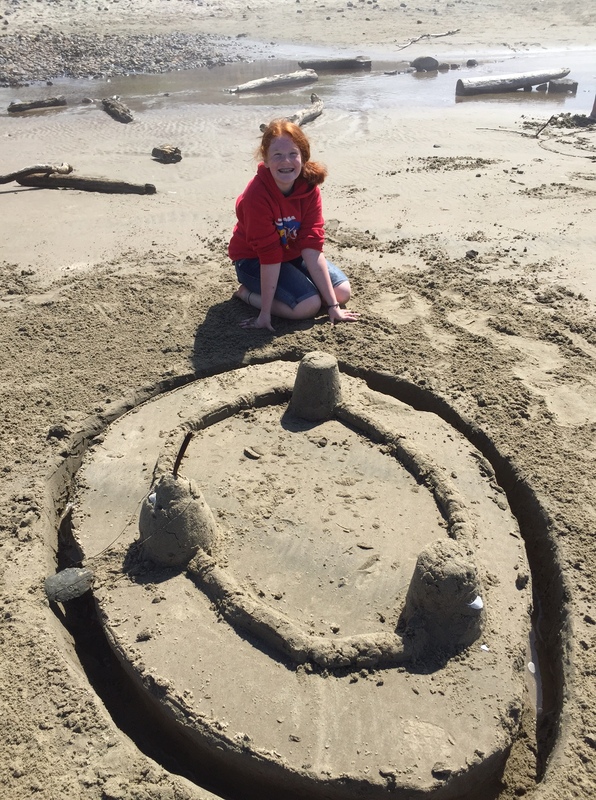 Or from making sand castles with water in the moat. The sun broke through the clouds and it turned out to be a very pleasant day. We had a bunch of food in the car, and munched away all day. On the way home, we grabbed some ice cream and fries from Dairy Queen….This crew sure loves their ice cream and fries!! 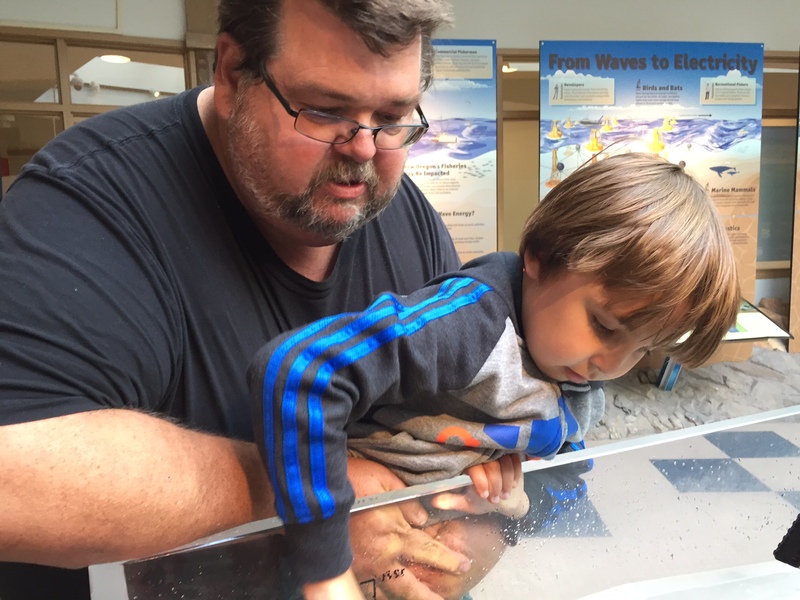 In the afternoon, we visited the Mark Hatfield Marine Science Center. We always enjoy it there, and they had changed quite a few exhibits from the last time we were there, so that was nice. After that, we went down to the docks and bought an albacore tuna from a fishing boat. The young man working there cut it up for us and we also kept the carcass. 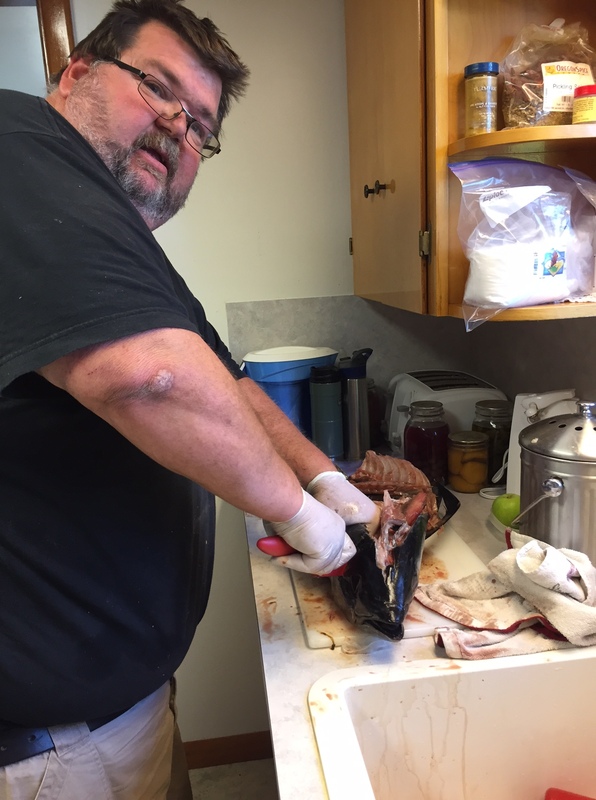 Rob plans to go crabbing soon, so he cut it up and froze it for bait. 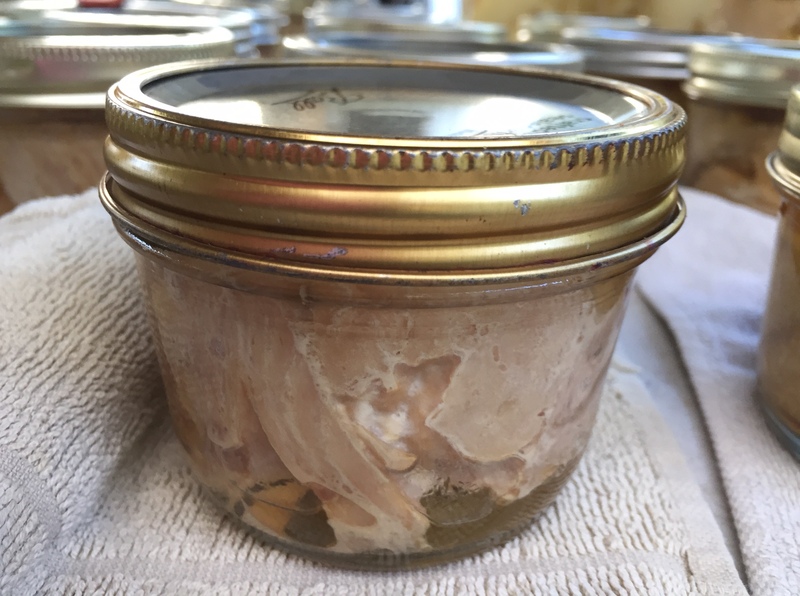 Today, I canned the tuna. I could have frozen it, then canned it later, but I wanted to get it in the jars right away this time. I cut it up, put it into the short, round 1/2 pint jars I keep for this purpose, added 1/2 teaspoon salt and a small square of the belly fat, then pressure canned it for 100 minutes. To translate this further–that means someone gets to sit on a chair for 1 hour and 40 minutes, making sure the pressure canner stays at the correct pressure. We were fighting for the job! Since Rob was cleaning the shop all day, he was a ready and willing volunteer for this job and finished up the processing time around 6. Then, it needed to cool until the pressure came down. I can put 3 layers of these jars in my tall canner, and ended up with 22 small jars and 1 pint. We ate the additional pint that would not go in. So far, it’s been a very productive week! Today was the first birthday party we are hosting this week. Here’s how we made it simple, affordable, yet very nice. I started by giving Patsy a handful of invitations I had saved when we moved. She wanted a small, special party so I have plenty from another occasion in my card bin. We chose a day after school when I knew I would have plenty of time to get ready during that day. She handed them out about a week and a half ago. Although we asked for RSVP’s, we only got one firm one, and a couple of “iffy” ones. So, we were not quite sure how many to expect. Then, I dug around in the cupboards and pulled out fancy dishes. 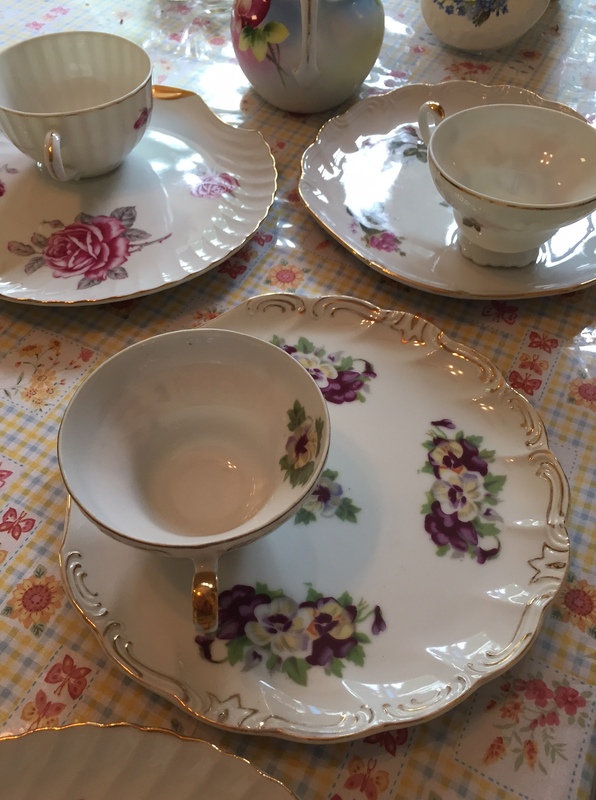 These little luncheon tea plates are from garage sales and a junk store and I have had them for about 20-30 years. There are a couple that match, but mostly they are different floral patterns. I have 8 or 9, and got 4 chosen and washed and the others set aside in case we had any surprise guests that forgot to tell Patsy they were coming. We are still quite new here, and had to also face the possibility that we would have only 1 girl, or even none if something prevented her from coming. There was a lot of anxiety going around here this morning. I was very proud of Patsy. It’s hard to keep trying and trying in life when there are lots of changes, and so much history of disappointment in the past. But, she was brave, and my prayers were answered. In the end, 3 girls ended up being able to come. They were delightful young ladies, and I enjoyed them very much. Patsy was so happy. 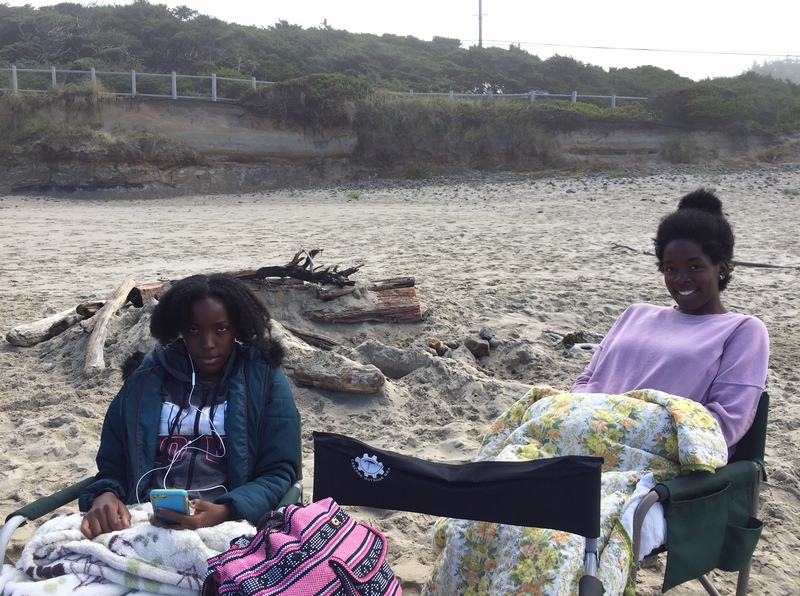 Alissa and Ja’Ana helped get ready this morning. They also worked a bit on school. They are almost done, and have very little to complete. 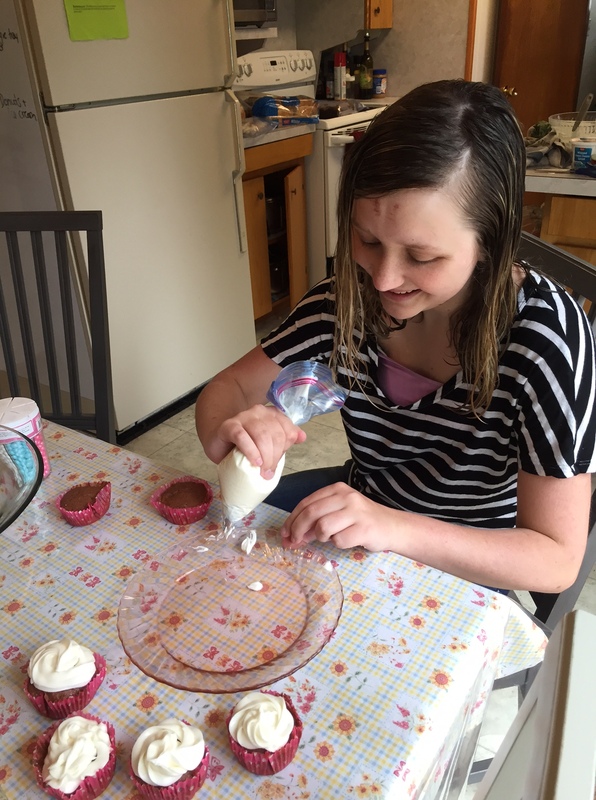 Alissa brought decorating supplies and worked on the cupcakes. She had frosted cupcakes I had baked and frozen last week. 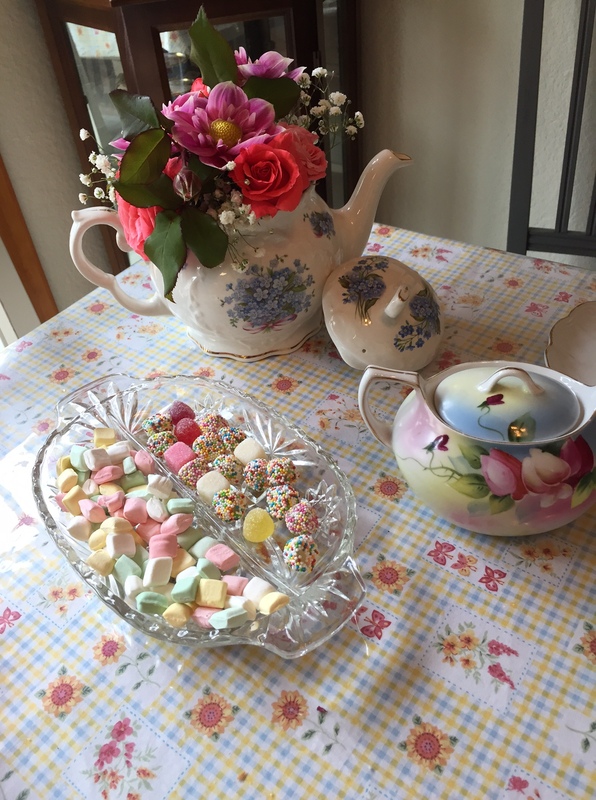 She added the candies on top, and we picked and added violas to make it special. We put Baby’s Breath on the fancy dish and…..gorgeous and special for pennies. I bought 1–$5 bunch of Baby’s Breath. 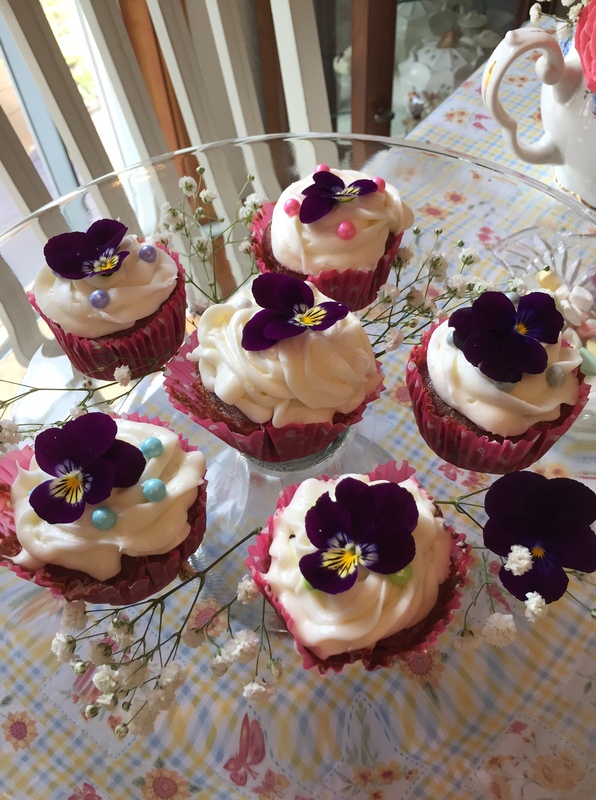 I used teapots I own, and roses and violas from the yard. 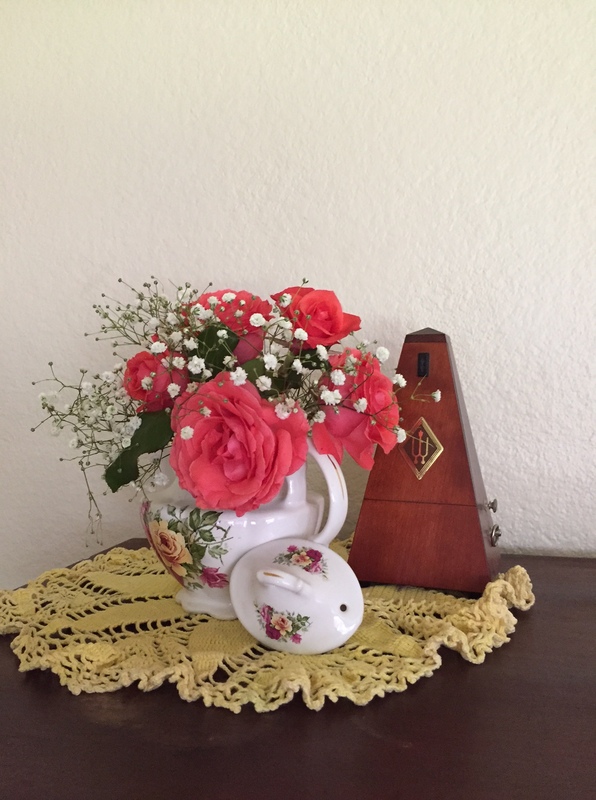 I put one bouquet on top of the piano and one on the table. 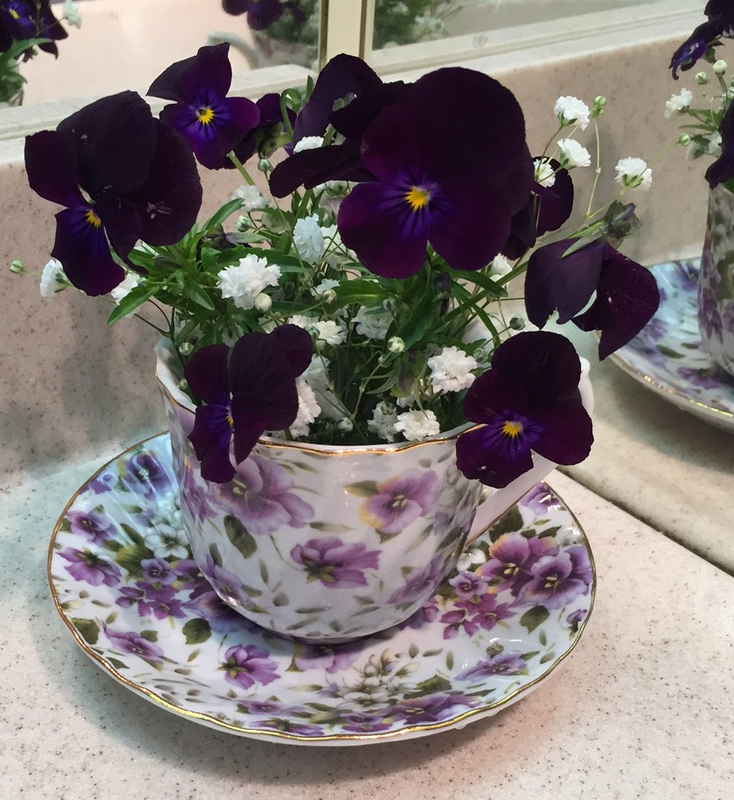 I used a tea cup and put one in the bathroom to take the elegance even further. No extra money involved. We bought some fancy mints and candy from the bulk bins at Winco. We used sugar cubes in the sugar bowl. The girls were excited about the cubes. They emptied half the bowl. 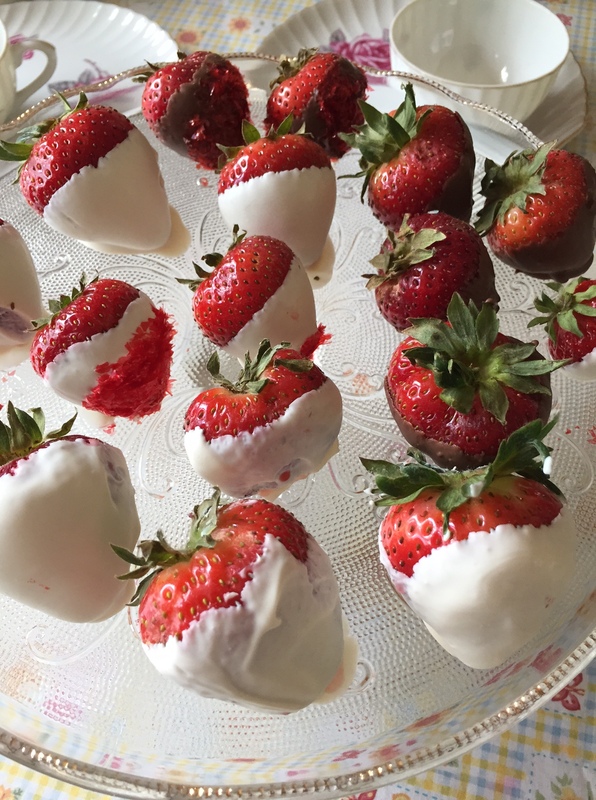 Ja’Ana and Alissa worked on the chocolate and white chocolate-dipped strawberries. I bought one carton of berries and a few melting chocolate disks from the bulk bins at Winco. Alissa brought some red sugar to use as well to make them even prettier. 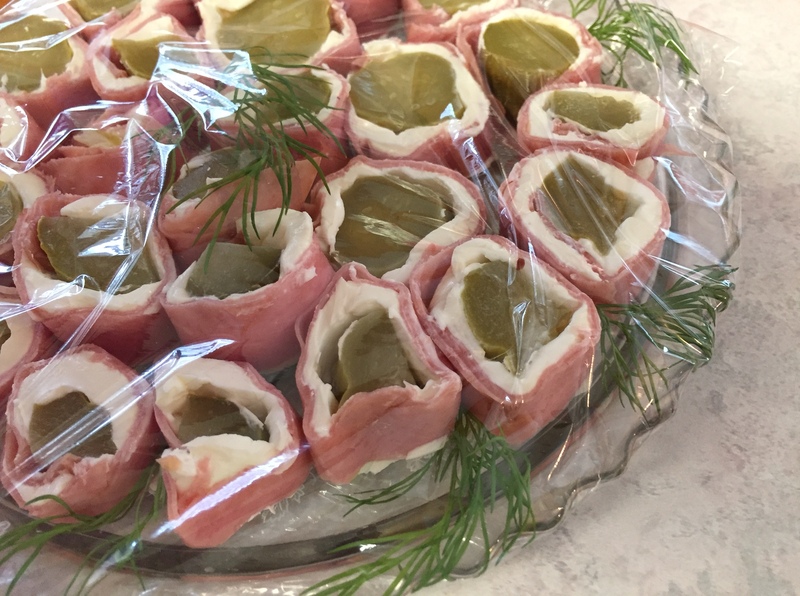 I worked on pickle rolls. They are very simple. You spread cream cheese onto lunchmeat and put a pickle on it, then roll up and cut into circles. It is a family favorite at holiday times and Patsy wanted the treat for her birthday party. I worked on little sandwiches, too. I cut white bread I got on sale for 69c for the loaf into circles with a biscuit cutter. I threw away the edges. If I was not gluten-free, I would have made crumbs from them, but we have no use for regular bread crumbs around here. I just make and use gluten-free ones. I used some of the circles for cream cheese/olive open faced sandwiches. Then, I added 1/4 piece of turkey pepperoni on top. I spread cream cheese, then placed 1 cucumber slice and a piece of dill on the rest. I also made some egg salad sandwiches from whole pieces of bread. I cut the crusts off and cut into quarters. I used fancy toothpicks for those. I also made a veggie tray in a fancy dish. Snow peas, the remaining slices of cucumbers, celery, carrots, and cherry tomatoes filled it nicely. The last thing I served was zucchini chocolate chip bread, baked and frozen last week. I also made 2 pots of tea. I let them choose and they chose Chai and Peppermint. That was easy enough, using my insta-hot on my sink. We used 4 tea bags, total. The girls visited for a bit. They then proceeded to polish off almost ALL of the food on the table. How gratifying! I was very pleased that they were so verbally appreciative, polite, and apparently very hungry! Afterwards, they went outside and played croquet on the lawn until it was time to go home. I made a list of food I wanted to serve on the whiteboard as I thought of it, and then used the list to shop and cook. I bought dill and used it more than once to get the best use of my purchase. I did the same with the Baby’s Breath. I figure if I’m going to buy it, I want to use it a lot. So, I’m very tired, but satisfied and happy. Patsy had a great party, I did not break the bank, we DID have some girls come to the party and they had a great time, my house is clean, and I have bouquets of flowers to look at. I should sleep well tonight. Where Do I Purchase My Seeds? I ordered my seeds yesterday, using a gift certificate I received for Christmas from Territorial. It is my favorite place to buy seeds, and I have been happy with their products for many, many years. I have some other seed companies I like very well, and have successfully ordered from in the past, but decided to keep it simple this year, and also save postage by purchasing it all from Territorial, along with the Dollar Store. I also may pick up a few packets from local stores if I find I’ve forgotten something or have a hard time with germination or slugs eat my seedlings. I was asked by a reader how I decided which place to buy each kind of seeds from–what made a “good” seed? What I am looking for in a seed is one that will grow vigorously in my climate, produce well, and have the qualities I am looking for. Some of those qualities include: The ability to fruit in a short season here in the Pacific Northwest, the ability to give me a lot of high quality produce in a short amount of time to can or freeze on vegetables such as beans and/or the ability to stretch the season out without bolting quickly in something like spinich or boc choi, and a variety that will grow in the space I have. Also, the vegetable needs to taste good. I grow many open-pollinated varieties. I also grow hybrid seeds if they have a quality I especially want. Some of those include: Shorter time until harvest, larger plant with more vigor and disease resistance, and a large crop. One year I lost my entire crop of tomatoes to a blight. After that, I searched for blight-resistant varieties. I do understand that if I tried to save seeds from those hybrids, they would not come out the same as the parent plant I saved the seeds from, as a hybrid is a cross of 2 plants. I do not save many seeds, so that is not an issue for me. 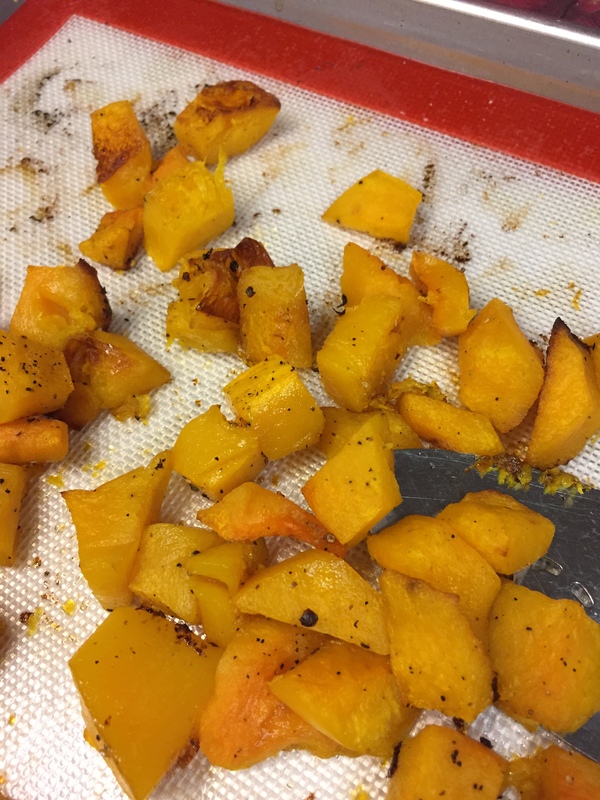 If I do save seeds, it’s often marigolds, squash, dill and a few other things, and I only save the ones that have not crossed with any other plant. I do not choose to grow GMO’s. I grow my garden organically, so I don’t worry about whether or not the seeds are organic. I know that what I serve on my table is not covered in sprays, in fact, sometimes it has a few more critters on it than I like, so I am careful when I wash my lettuce, especially. Seeds from seed companies are expensive. Seeds from the Dollar Store are cheap. 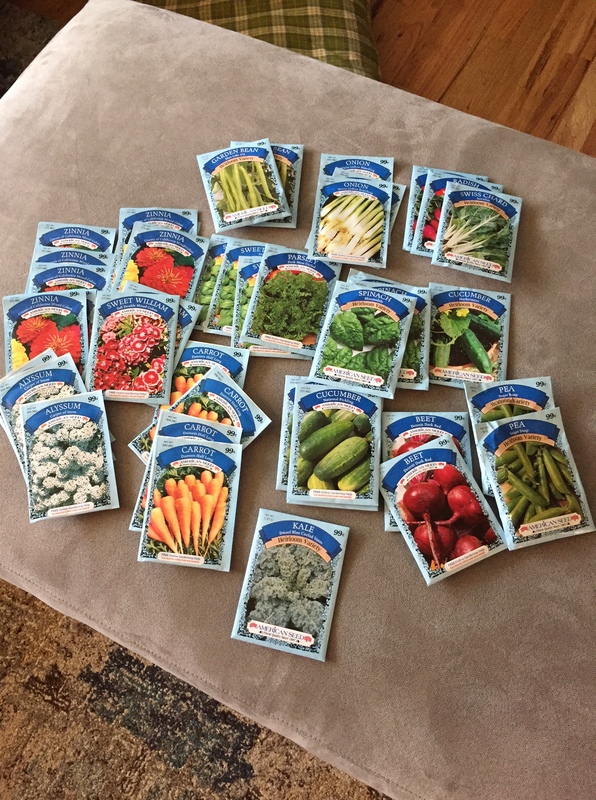 Seeds purchased from the garden store, Bi-Mart, Fred Meyers, etc. are often somewhere in the middle, especially when you get a sale. So, how do I decide where to buy mine? I’ve done some experiments in the past and will continue exploring that question. I have had great success with Dollar Store cucumbers. 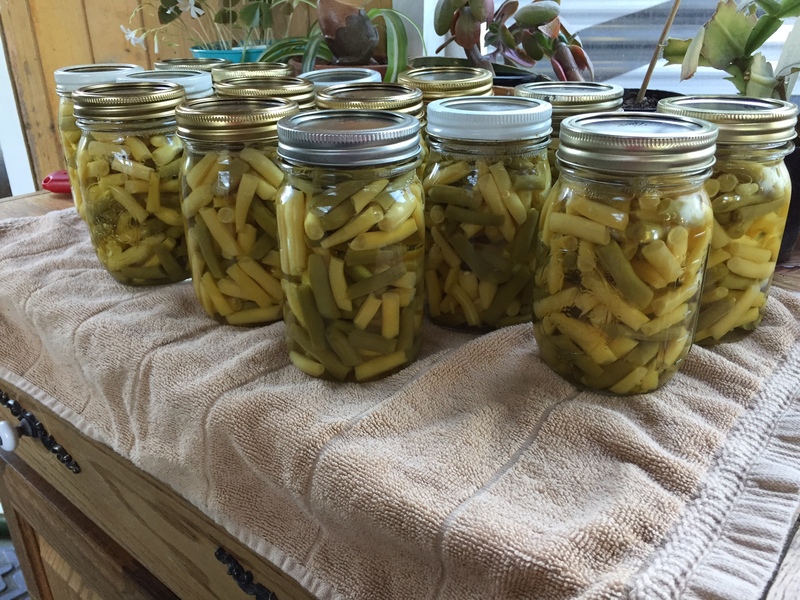 I have made jars and jars of pickles from Straight 8 and Homemade Pickles varieties. Because they are old, open-pollinated varieties, and are 4 packs for $1, I make a big hill and plant tons of seeds all over it. They may not have hybrid vigor, or the highest production per bush. Since I plant several packages in one huge hill (around 4-5 feet long), I’m planting enough bushes to get lots of cukes. We will see if I want to continue that practice in my much-smaller garden after this summer, or if I want to switch over to a more compact variety. 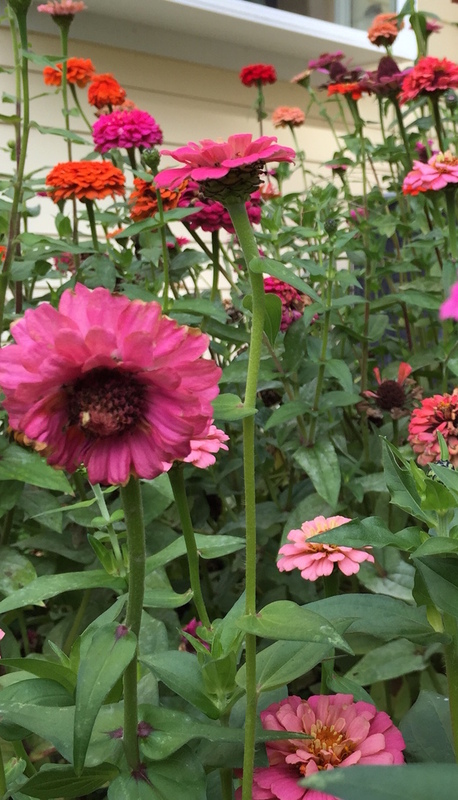 I also get great results from their zinnias. Again, I just plant tons and tons, and enjoy. These are from my old house, and are all from Dollar Store seeds. 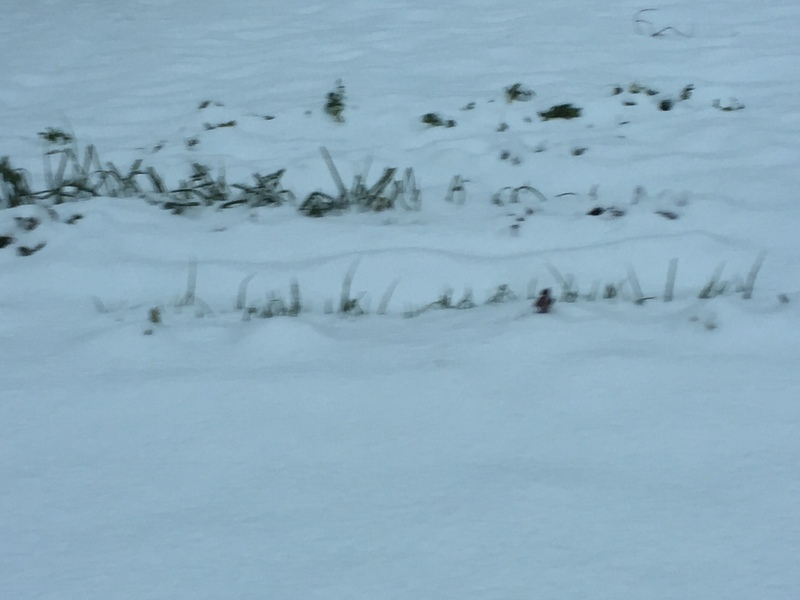 At most, I used $2 worth of seeds for a huge flowerbed full. It’s a lot of bang for my buck. 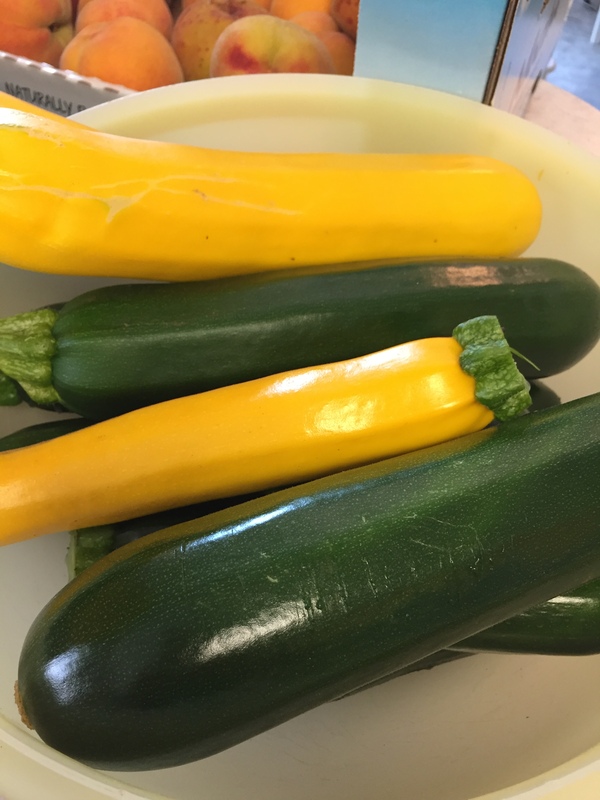 This year, I am growing Raven zucchini, and Easypick yellow zucchini from Territorial. When I did side-by-side zucchini trials (Territorial vs. Dollar Store), 2 years ago, I found the more compact bushes from Territorial yielded more and had a more open growing habit, enabling easier picking. The Dollar Store ones were more gangly, yielded less, and succumbed to powdery mildew sooner. Raven is a new one for me this year, and promises a more compact bush. I could not keep up with the Easypick when I grew it, but I like to share. You may be perfectly satisfied with the amount you get from the Dollar Store seeds, and in fact, may be rejoicing when they die from powdery mildew. No matter where I buy my seeds, zucchini tends to out-produce my need every year. I also ordered Bush Delicata squash for the same reason–compact growing habit. I ordered a lettuce blend, spinach that is not supposed to bolt easily and Joi Choi boc choi that they say grows bigger, faster. I know it does because I’ve tried several kinds from different places over the years. The kind I planted last fall never grew larger than about 6 inches. Hmmm. I also have successfully grown lettuce from the Dollar Store. Last year, we ate romaine from the same kind for weeks and weeks. It’s a lot of lettuce for a quarter. Again, I just plant lots and have no trouble having more than I can eat. 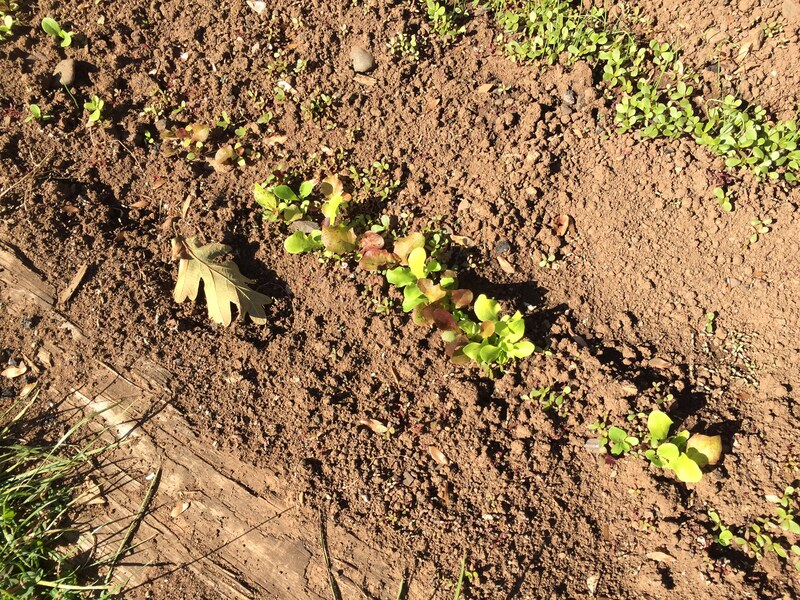 I happen to love Buttercrunch lettuce–it’s my favorite–and I ordered a large packet of that kind. I also ordered red-spotted butter crunch lettuce. It is a slow-bolting kind and I will grow it in the summer. Green and yellow beans (I like to mix them when I can them), are something I don’t mess with. Because I need a large amount, I won’t gamble on seeds that may not produce as well. I’ve grown Venture beans from Territorial for years, but they don’t have them this year and recommended Speedy. I will try them. I like Carson beans for the yellow ones. We use so many beans that I want lots and lots of beans at the same time to preserve. 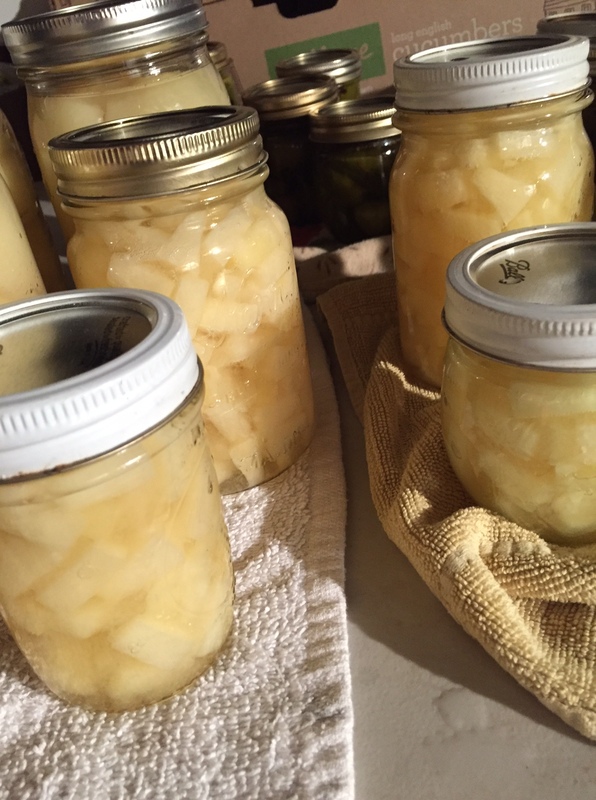 It is not uncommon for us to use 50-75 quarts in one winter, depending on if we have them 1 or 2 times per week, and how many weeks the fresh ones held out. Carson strings the season out a little longer, but I’m hoping this new kind (Speedy) performs the same as the old ones I used to grow–oodles of beans in 8 weeks. I also grow a few pole beans for fresh eating. I got 2 packages of Blue Lake pole beans from the Dollar Store. 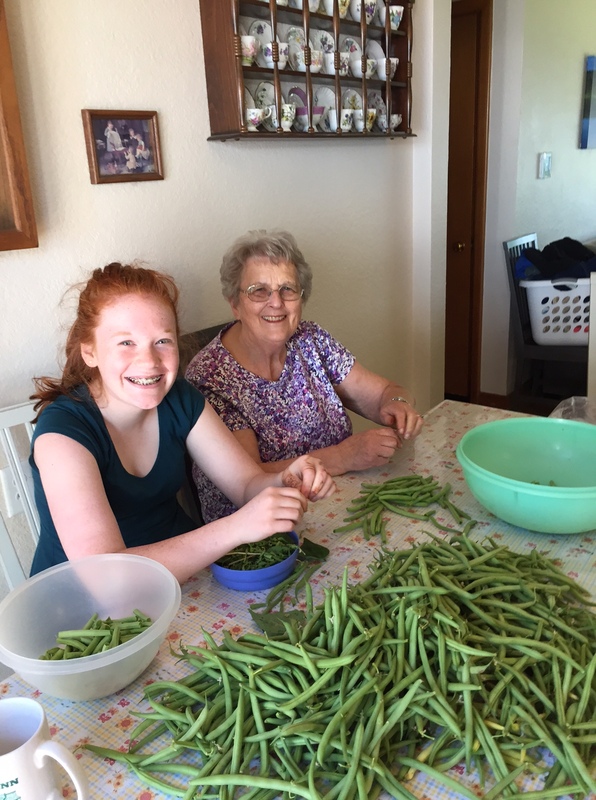 Blue Lake is a great kind, and the pole beans will produce until frost. I also got purple pole beans, a small pack, to eat fresh as well, from Territorial. Those are the kind of things the Dollar Store doesn’t sell here–they just sell the most basic varieties. When I start things like tomatoes and peppers, I am looking for certain varieties that mature early, have disease resistance, and produce well. I bought my starts last year, and will again this year, and could not find the varieties I wanted. So, I took what they had. 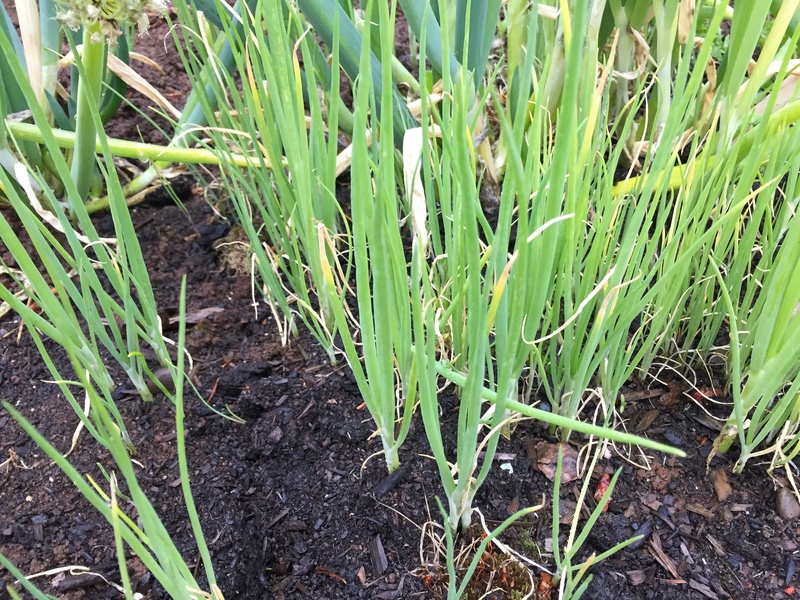 Still, they grew fine, and I’m sure I’ll find varieties I can live with again this year, and every year until I get set up for seed starting again. I will also buy cabbage, onion, and broccoli plants. When I start plants from seed, I like to order the Territorial broccoli blend and it comes out as a mixture of kinds that mature over time and I freeze and eat for weeks. To sum it up–I have tried a lot of varieties in the past, and will continue to do so. We rely on our garden for year-round eating, so I feel it is worth it to put some money into seeds to get varieties that meet my needs. Everyone’s needs are different, so different solutions will be needed. I am exploring space-saving options because the garden is much, much smaller than my old one, and also pole varieties for the same reason. This year, I will not be doing much experimenting with new or unusual vegetables. Instead, I will be getting used to the new garden space, seeing what grows here in this slightly different climate (lower elevation), and figuring out how much produce we really need with our ever-shrinking family size. It’s unbelievable! 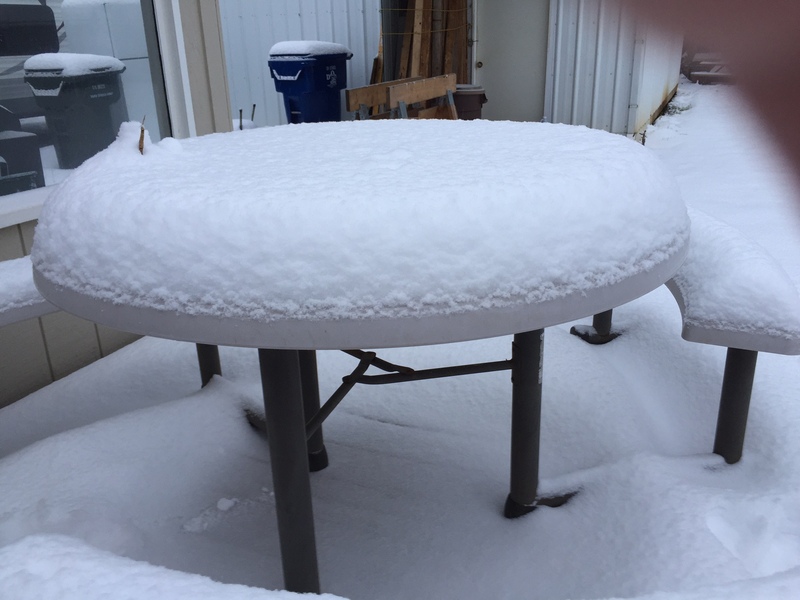 We got hit with a snow event even bigger than the one last week! This is very rare in our area, so I don’t think people took the weather people very seriously. After all, we have been promised snow many times and no snow showed up. So, all of the children went off to school Wednesday morning, as usual. People went to work. Around noon, it began. 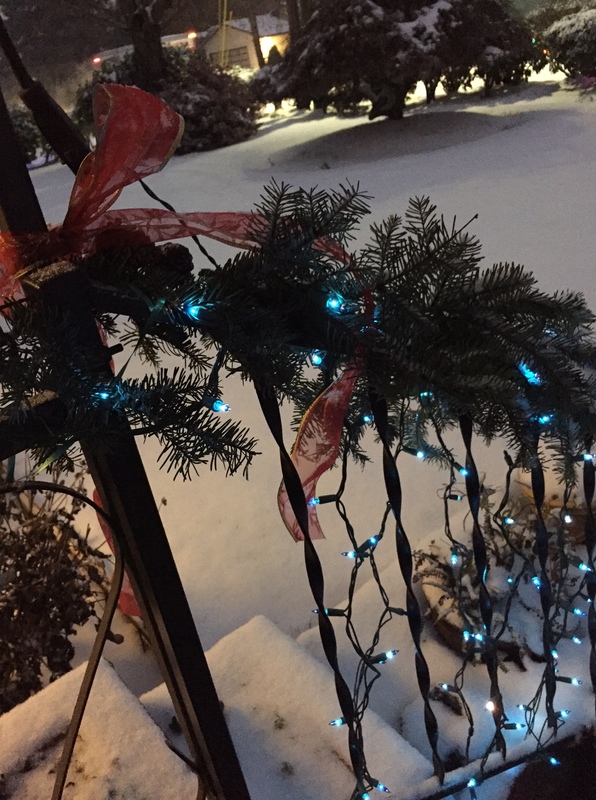 By nightfall, we had over 4 inches. Incredible! 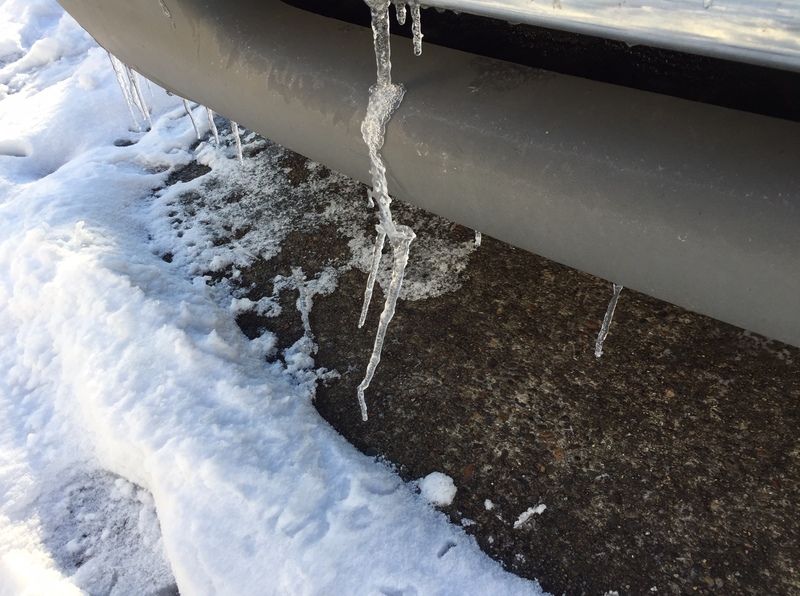 By the time I had pushed my way through the people grabbing items, got the things that were left on the emptying shelves, and stood in a long line, the snow was pelting down, mostly in the form of ice pellets. But, I had my milk! I began to drive home. The roads were clogged with drivers, all of whom were driving deliberately and carefully through the ever-falling snow. We got to go about 5 miles per hour in quite a few places and got all the way up to 20 in a couple of places. I spun my tires on a hill, but got up fine once the tires got a grip! For me, that was more than enough excitement! I have not left the house since I got safely home, between 45 minutes and an hour later. Then, we waited for Rob to show up. He was at school and needed to ride the bus home with a child, as he normally does. They let out 2 hours early. He did make it safely, but it was much closer to his regular time–not very early. He was on that bus for a very long time and there were a few dicey moments, but it was all good for him. In Portland, Oregon, the story was a bit different. Some students did not get home until 11 at night, buses were sliding down hills, and traffic was gridlocked for hours and hours, taking some people 4-6 hours to return home. Glad I didn’t go to Portland that day, as I had planned. Each day since, the schools have been cancelled, the snow has melted slightly during the middle of the day, and frozen back up each night, with temperatures down into the 20’s. For many of you, that is nothing. For us, here–it’s so very, very rare it is a novelty. Rob drove to get Jake, my nephew, yesterday, with no problems. He will go drive around a bit today, just because he likes to. As for me, I’m content to sit in my warm, cozy house and enjoy the luxury of being able to cook and sew to my heart’s content! I just may finish Michaels’s pajamas today, and the meals that I have time to cook and pretty yummy, I must say–warm soups, home-made pizza, and more. All-in-all, it’s been a terrific vacation for me!